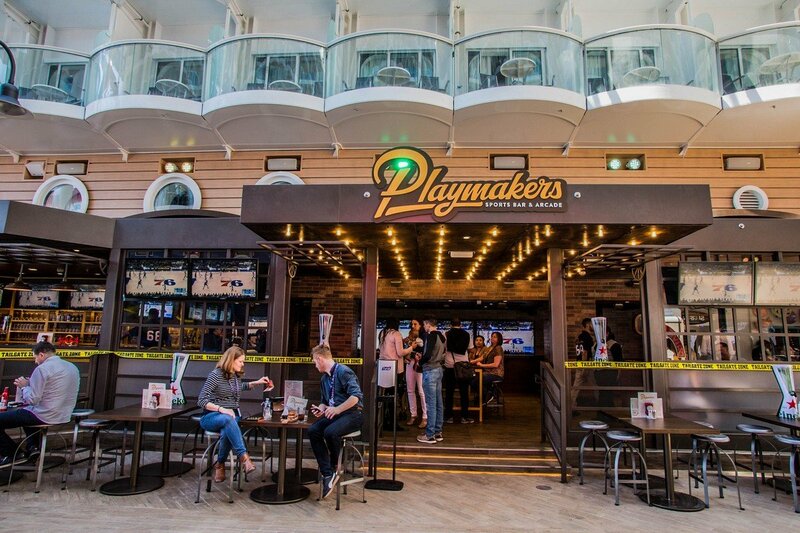 From time to time, Royal Caribbean tries out a new specialty restaurant concept, with Playmakers Sports Bar & Arcade the latest addition to the fleet. The idea is simple, capitalize on the popular sports bar and pub food trend and offer Royal Caribbean guests some simple, yet tasty food with plenty of opportunity to watch or play. Royal Caribbean felt so strongly about Playmakers, that the restaurant is at the heart of the re-deisgn of the Boardwalk neighborhood on Symphony of the Seas. With as much buildup as this restaurant as had, I had to try it out for myself. When you hear of a sports bar that offers great food, tons of televisions and games abound, undoubtedly land-based restaurants of similar ilk must come to mind. It is only natural for any new restaurant one may try to be compared to other similar venues. Located in the Boardwalk, Playmakers Sports Bar & Arcade takes up one entire side of the neighborhood and features an open-air venue that is designed to tempt guests to walk in and check things out. The restaurant features plenty of seating, inside and outside. The outdoor seating is your typical table and chairs, while indoors there is a variety of seating. Bar seating, booths, benches, high tops and more. This is a casual dining venue, first and foremost. At each table, you may find a game like Connect 4 or a peg game board. Speaking of games, Playmakers is also home to a mini-arcade. Skeeball, video games and more are part of the restaurant experience. Given the name, it should come as no surprise that there are lots of televisions around the restaurant to watch sporting events. Royal Caribbean says there are 30 televisions around Playmakers. 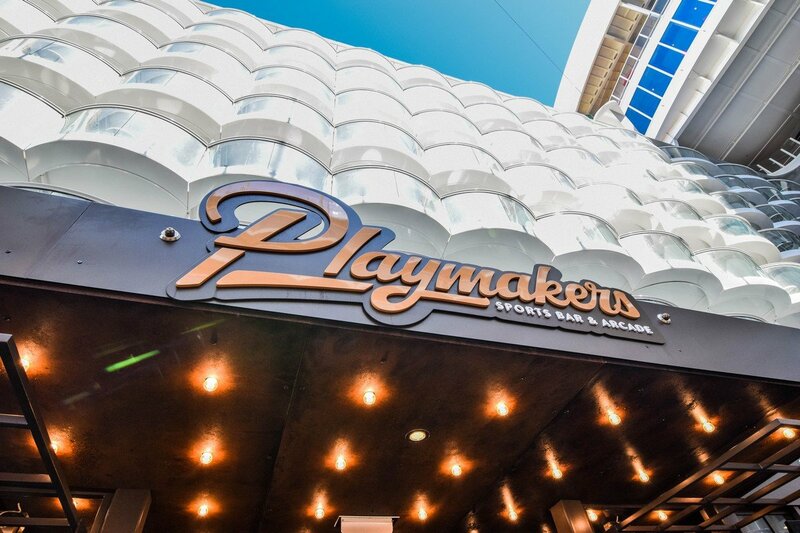 Playmakers wants you entertained while you are there, ordering plenty of food and drinks. Royal Caribbean created a whole new menu to enjoy while you spend time inside. When you talk about a sports bar, beers and cocktails are going to be a big part of the experience. Playmakers offers a lot of domestic and international beers, including a good amount of craft beers. If beer is not your style, there is a full bar at Playmakers as well. Any guest can drop in by the bar and grab a drink without having to dine there. 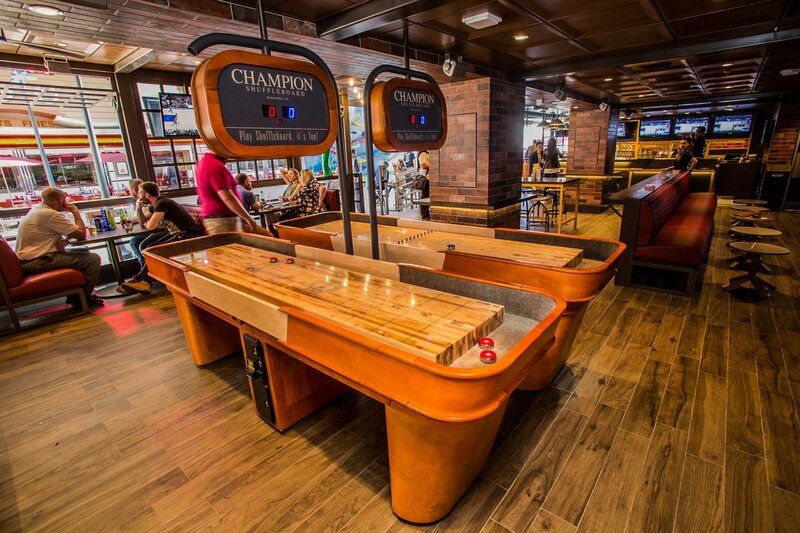 A large bar allows guests to stop in to get a drink and go, or stay and enjoy a game or two. You can also order food from the bar, which provides flexibility if “just one drink” turns into “I can’t believe this game went to double overtime!”. While the drinks are a big component to what Playmakers offers, the food served up is what will likely bring many to try Playmakers. Being a sports bar, Royal Caribbean came up with a menu that reflects the kind of casual comfort food you might find at popular restaurants of a similar theme. Burgers, wings, fried chicken and the like are at the heart of the menu. No surprises on this menu, but that should not be a surprise in itself. 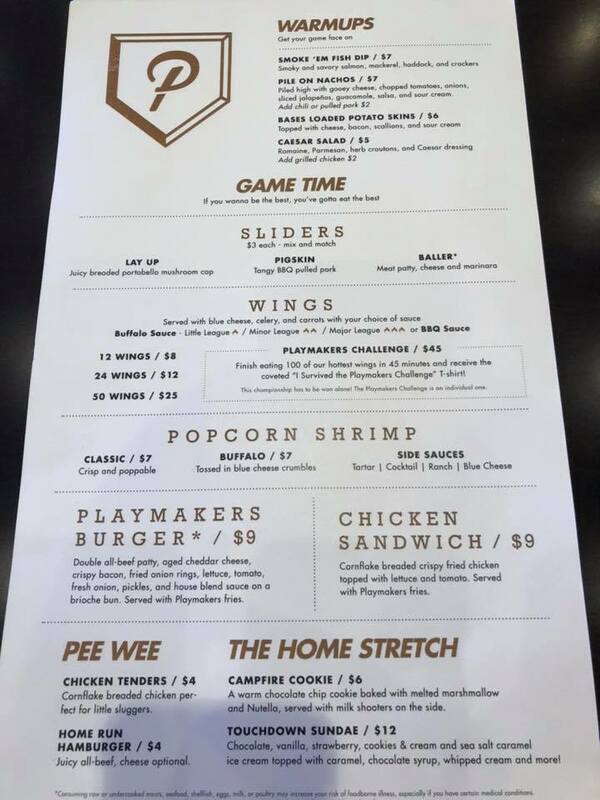 The Playmakers menu is priced a la carte, which means you only pay for what you order. 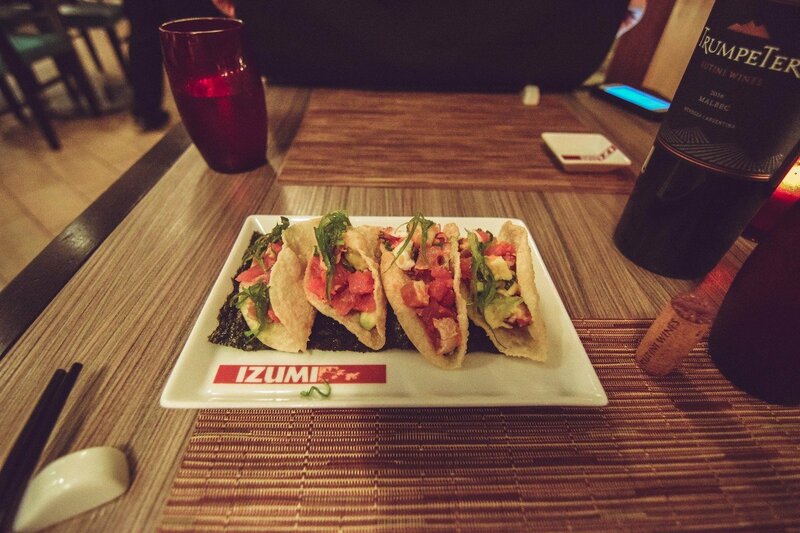 Like Izumi, that means you can drop in for a snack, or opt for a full meal. That kind of flexibility is a major strength of Playmakers, since not everyone who wants to enjoy specialty dining wants a drawn-out meal. We stopped by Playmakers on a few occasions to sample some of the menu. Depending on if you are going for just a small bite or a big meal, there is plenty to choose from. 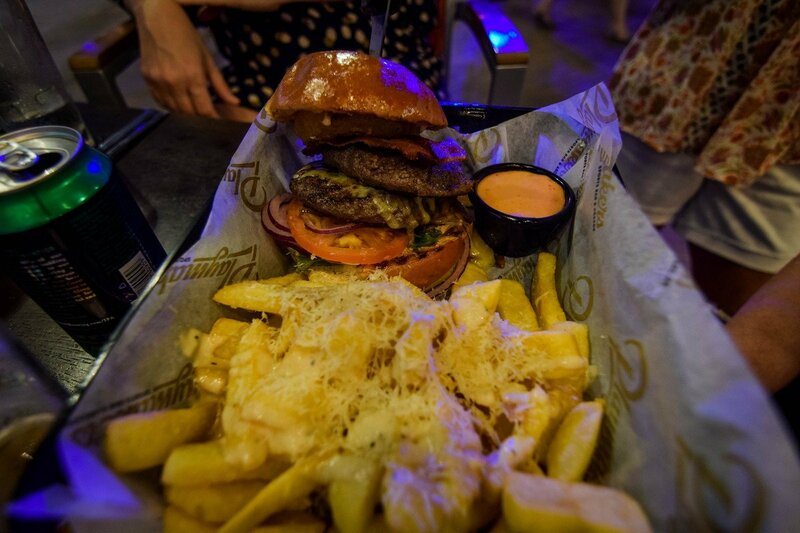 The best item on the menu has to be the Playmakers Burger. A double beef patty on a brioche bun makes arguably the best burger served on Royal Caribbean’s fleet. Yes, better than even Johnny Rockets across the Boardwalk. 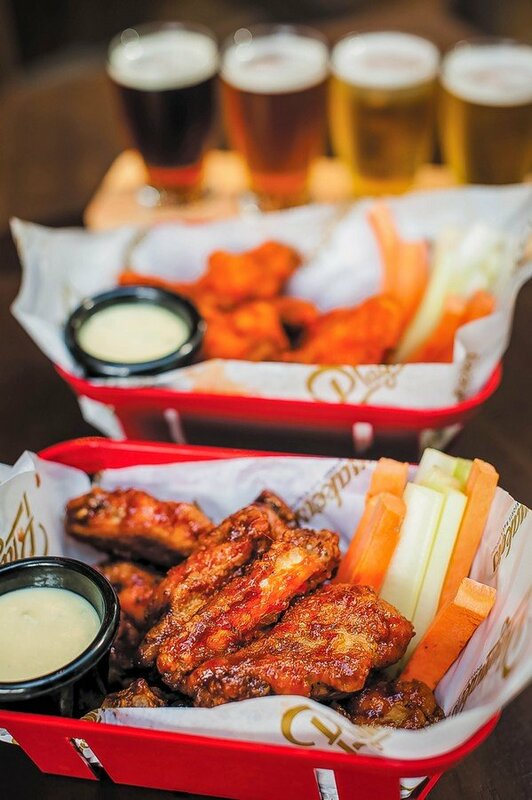 If wings are your thing, you can choose between 12, 24 or 50 wings across four different buffalo sauces. If you are feeling dangerous, try the Playmakers Challenge: 100 of their hottest wings to be eaten in 45 minutes or less. If you can do it all by yourself, you can get a special t-shirt to commemorate the accomplishment. A perfect option for eating at the bar for part of a game might be their sliders. Choose between a portobello mushroom, pulled pork or meat patty, or go for a combination of them all. In addition to all of that, there is still nachos, loaded potato skins, chicken sandwich and more. 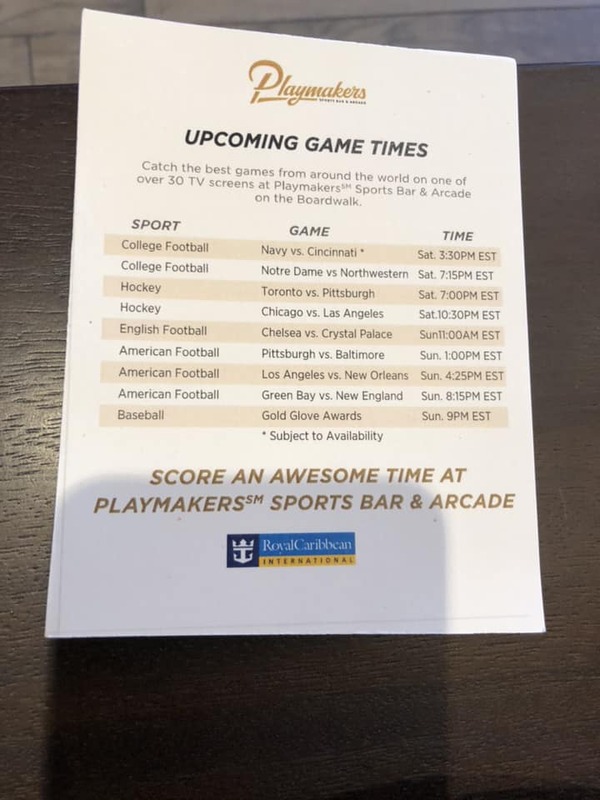 Playmakers Sports Bar & Arcade is not a revolutionary idea, but it is a great representation of what a modern sports bar is all about. Royal Caribbean seemed to have read the tea leaves of what is popular these days, and came up with a fun casual experience that fits nicely into the Boardwalk. What we love best about Playmakers is the extensive menu, ample television viewing opportunities, and inclusion of games. It is a dead simple concept, and it works. Price-wise, there is decent value with the offerings on the Playmakers menu. Other than the sliders, everything on the menu offers a large serving and I think in many cases, you can easily share the food with others. Without a doubt, the experience is as critical to the draw of Playmakers as the food. Royal Caribbean bills Playmakers as the spot to watch your favorite team play. While there are a lot of televisions and ample spots to watch a game, the realities of television contracts, blackout rules and international viewerships limit how much you might want to actually watch. Without getting into a lengthy discussion of how Royal Caribbean can legally show a game, it is important to note that the television programming tends to show primarily international competitions that most Americans may find less than enticing. Cricket, soccer, and international basketball are quite commonly shown. Thanks to Ron Hiller for this photo. That being said, on football Sundays, college football Saturdays and other evenings, you will find more familiar games shown. It is impossible to know which games will be shown on your sailing, but Royal Caribbean does make an effort to showcase the more popular sporting events, especially during the playoffs. 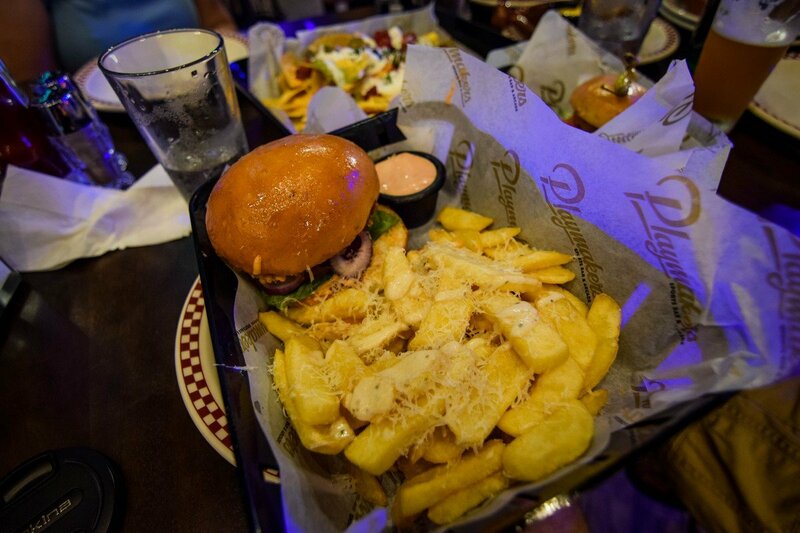 In a nutshell, Playmakers is a good choice for a casual meal, preferably while watching a sporting event. The clichéd saying, "come for the game, stay for the food" holds up, and I think the food stands on its own even if there is only cricket or curling on the TVs. What are your thoughts on Playmakers? Leave us a comment and tell us about it below! Izumi, how do I love thee? Shall we count the ways? Over the years, I have managed to eat at seven different Izumi locations across Royal Caribbean and review them, here on the blog. You might think the experiences tend to run into each other, but on Rhapsody of the Seas I found fairly unique Izumi experience. Of course, the sushi at Izumi remains very consistent (and excellent) across the fleet, thanks to the hard work of the specialty restaurant's ongoing efforts. The sushi alone is worth my many visits to Izumi, and why I continue to make reservations for Izumi. It is pretty much one of those spots I visit whenever I have an excuse to do so. Speaking of excuses, on our Rhapsody of the Seas cruise, there was an advertisement in the Cruise Compass towards the end of the cruise where you could pay $25 and get a $50 credit to use at Izumi. You may not run across such a promotion, but always keep an eye out for specials! 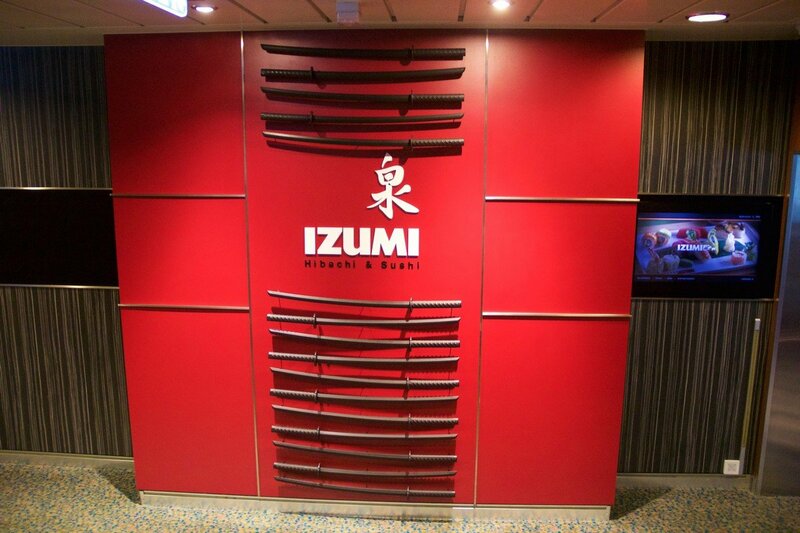 Izumi on Rhapsody of the Seas is not easily stumbled upon, as it is located at the very top of the ship on Deck 12. In fact, it's kind of on a half hidden deck, behind the Viking Crown Lounge. Suffice to say, there is not a lot of foot traffic in this part of the ship. For those that do venture to deck 12 to see Izumi, it is arguably the most beautiful Izumi location I have ever been to across Royal Caribbean's fleet. 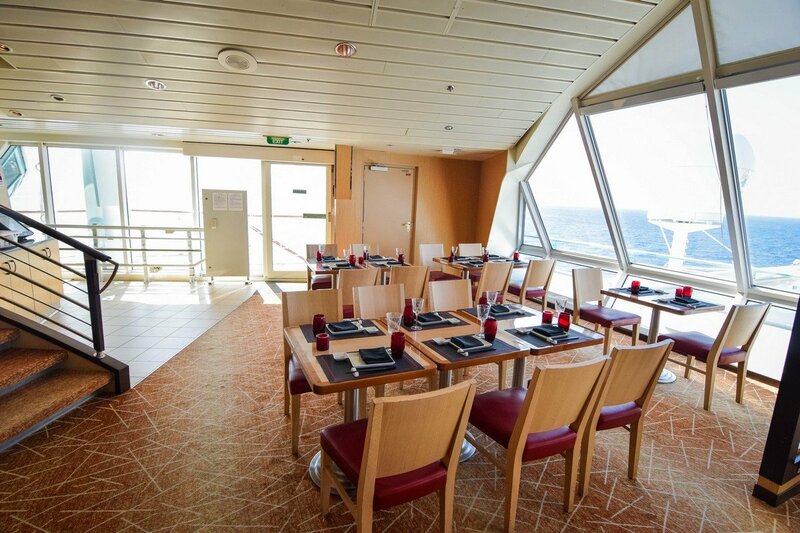 The restaurant sits in a kind of half circle, with an "upper deck" that overlooks the Viking Crown Lounge below. 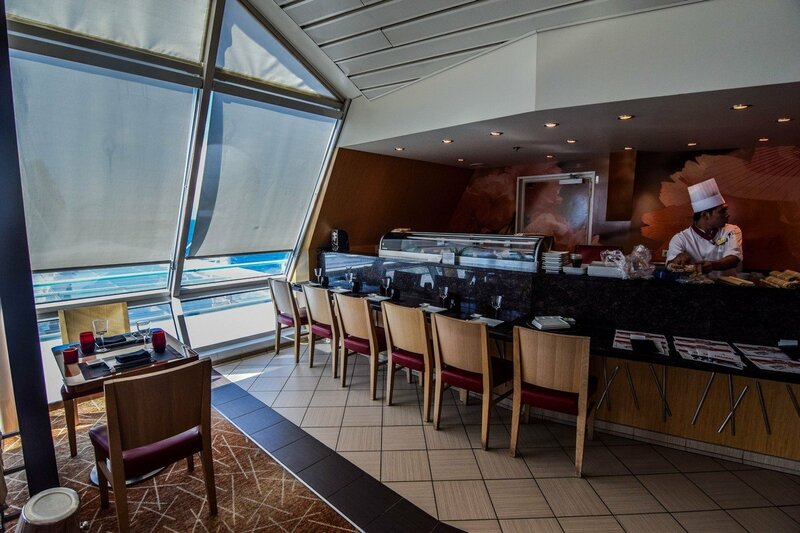 Out the back of Izumi, you have a perfect view of the aft of the ship, with the Solarium roof providing the perfect viewing angle to the ocean and sky behind it. During our lunch, we spent most of the time just gazing out to the back of the restaurant (when we were not gorging on the terrific food). If you are new to Izumi specialty restaurant, it is a specialty restaurant that is priced a la carte. That means, there is no cover charge and you simply pay for the food you order. 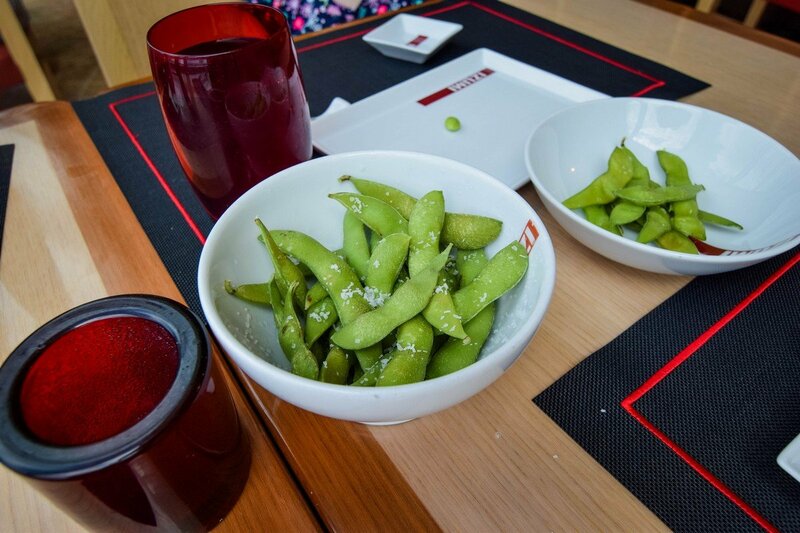 All meals at Izumi begin with a complimentary bowl of edamame, which is a boiled soy beans sprinkled with salt. 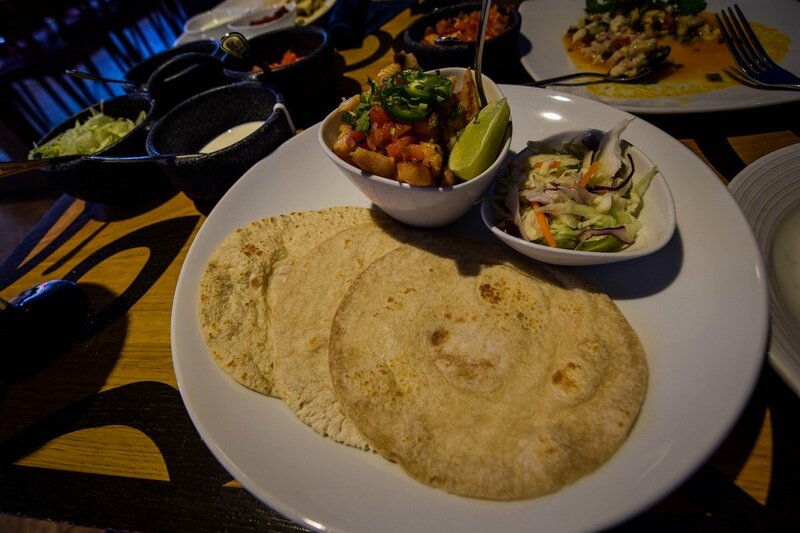 A perfect starter to nosh on while you look over the menu. I always start my meal with a bowl of miso soup. To me, it is a quintessential Japanese meal starter. Izumi has a fairly large menu, and their appetizer selection includes some really tasty options. The gyoza dumplings and chicken kara-age are great shareables (although one person can easily finish them off). Having tried the Mixed Poke Taco on Brilliance of the Seas last year, I gravitated right back towards them again on this go around. Tuna, avocado, albacore and octopus in a crispy wonton shell is a really good combination. Also somewhat new and already a favorite choice is the Boxed Yellowtail. 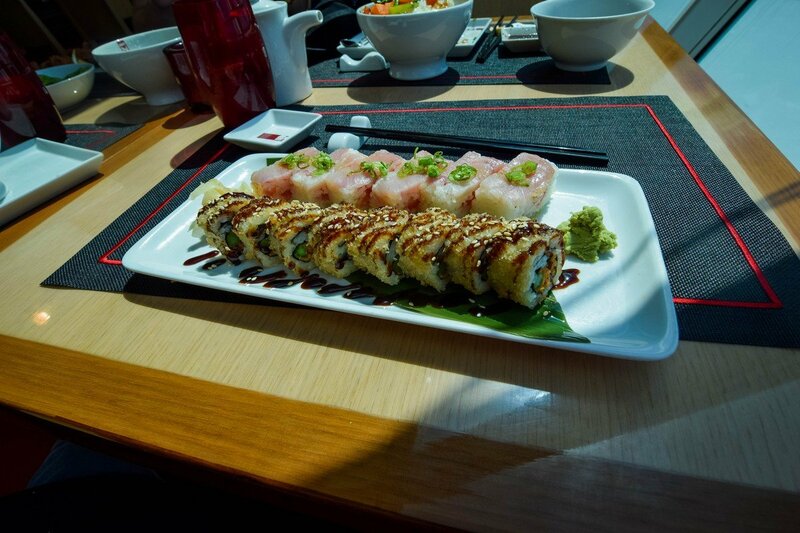 When it comes to sushi, yellowtail is never a bad choice. I also opted for another sushi staple, the Crispy Spicy Tuna. I never shy away from an opportunity to dine at Izumi, and when I found that $25 for $50 deal in the Cruise Compass, I found my perfect excuse. In a nutshell, the food at Izumi is excellent all around. Their sushi is of outstanding quality, and their non-sushi items are also quite good (if not underrated). Even if you are not much of a "sushi person" I think you will find something to enjoy on the menu. By far, if you happen to be sailing on Rhapsody of the Seas (or another Vision Class ship with Izumi on Deck 12), do yourself a favor and go up there for lunch. The views on worth the price of the food you get. 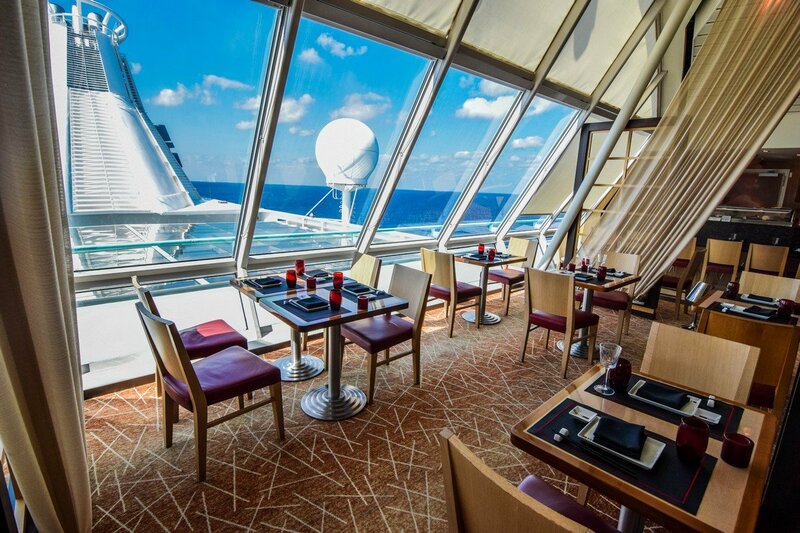 When it comes to dining at Izumi on Rhapsody of the Seas, come for the sushi, but stay for the views. On a recent Brilliance of the Seas cruise, we decided to revisit a popular Royal Caribbean specialty restaurant, Chops Grille, to see what's new in this classic restaurant. 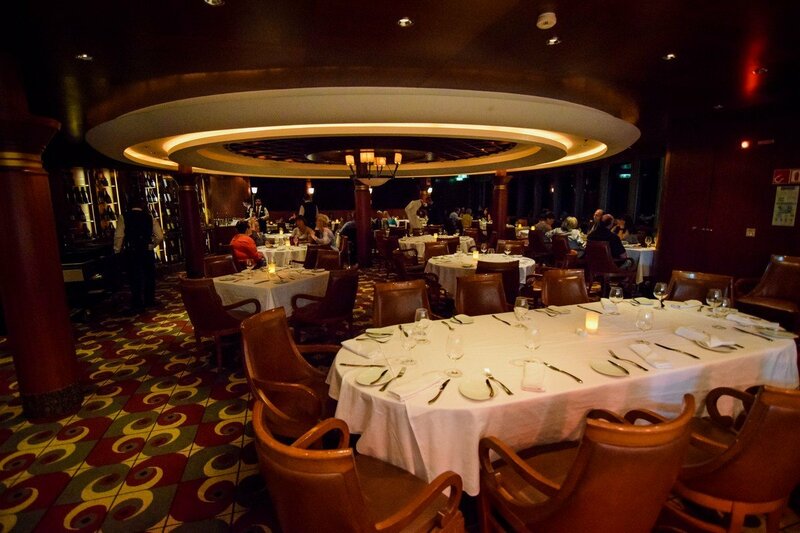 Royal Caribbean's signature specialty restaurant, Chops Grille, remains a favorite for many who cruise Royal Caribbean often. It's inviting atmosphere, great cuts of meat, and service have earned Chops Grille quite a reputation among repeat cruisers. While Royal Caribbean continues to add new specialty dining options periodically, Chops Grille remains a popular choice. 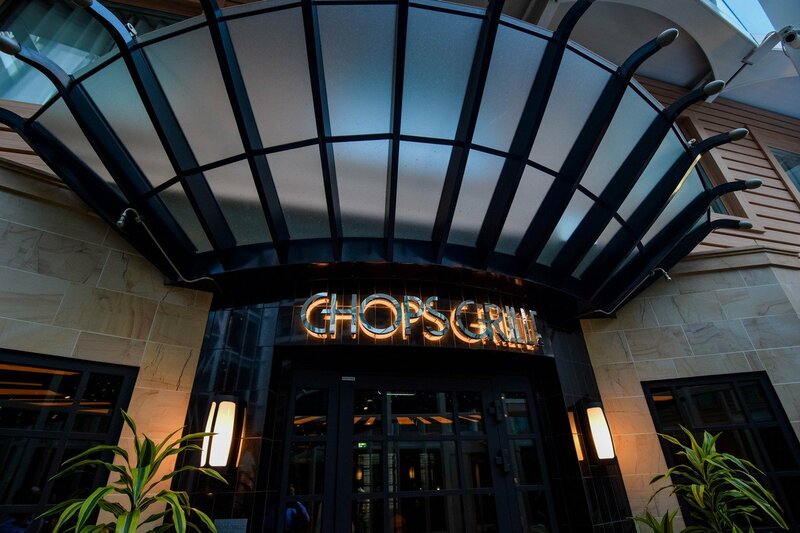 Many blog readers have shared with us their positive experiences at Chops Grille, so I wanted to re-visit Chops Grille on Brilliance of the Seas to ensure it continues to be somewhere I can recommend to others. And so, in the name of research, my wife and I have returned to Chops Grille once again. 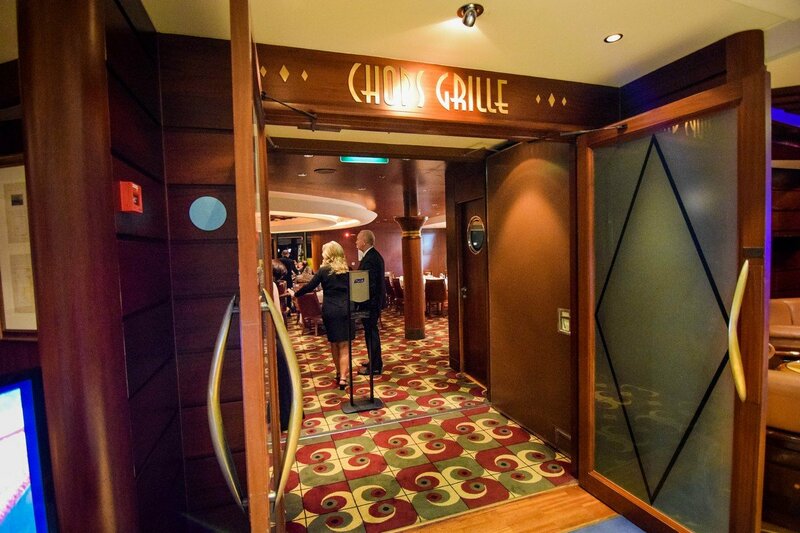 Chops Grille on Brilliance of the Seas is located conveniently on deck 6 near the Schooner Bar. Its location adjacent to Giovanni's Table and across from the Schooner Bar makes it an easy-to-find restaurant, since there is a lot of foot traffic in the area and odds are you will walk past it multiple times on your cruise. Walking into Chops Grille, you will find a large, open room that has tables filling the interior, with some booths along one side. A few tables are near the windows to provide a view outside. Chops Grille on Radiance Class ships has a large open kitchen, which provides a nice view for guests into the work being done to prepare food. 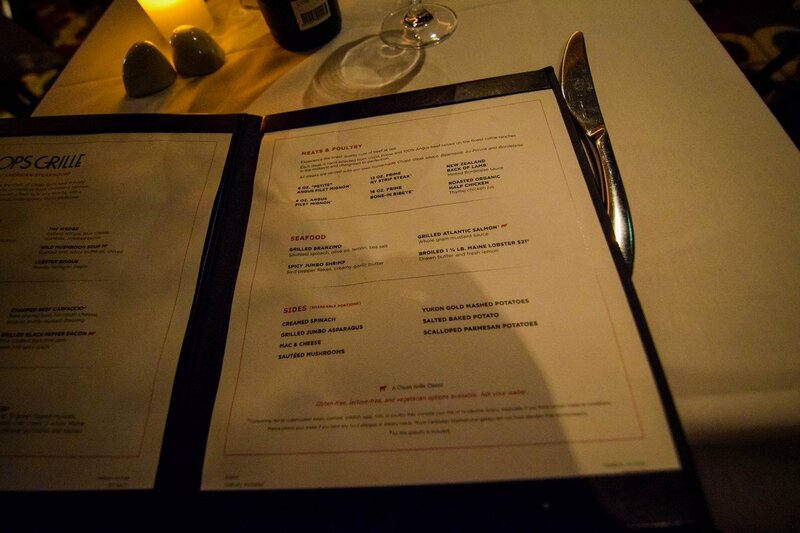 The Chops Grille menu on Brilliance of the Seas has changed recently, to bring with it the "new" Chops Grille menu. Other ships in Royal Caribbean's fleet have this updated menu, and Brilliance now joins them with it. You can always tell the new menu from the old menu based on the fact the new menu offers seafood towers, as well as does not have the French onion soup. While I lament the loss of the French onion soup, I decided to try the Wild Mushroom soup. After all, it has truffle oil, so how bad could it be? I really enjoyed this mushroom soup because the consistency of the broth was just right. It was not too thick or watery. Of course, the white truffle oil helped distinguish this from a mushroom soup you might heat up at home. From the Signature Appetizers, I went with the tuna tartare. Admittedly, I can never resist tuna, and this version was outstanding. As a self-described ahi tuna habitué, I found this to be worthy of a Brazilian steakhouse style operation, where my waiter would bring me as many as I want until I turned over a card to indicate I was satisfied replete. For our entrees, I was not sure what to order. My wife always picks the filet mignon (no one ever regrets filet mignon), but I was not sure what to do. I opted to ask our waiter for his recommendation on what he really enjoys. He pointed me to the New Zealand rack of lamb. I know what you are thinking, "There are entrees on the menu that do not have beef?" but it does indeed exist. My hesitation about lamb is that it can be tough, and I spend more time trying to extract the meat from the bone than actually enjoying the food. Nonetheless, how could I object to a recommendation made by a crew member I had met just 15 minutes earlier? I rolled the dice on the lamb. To my pleasant surprise, the lamb was extremely soft, and essentially fell of the bone. Instead of wrestling with the knife or wondering aloud to my wife what time the Windjammer is open to, I spent a few glorious minutes enjoying a terrific serving of lamb. 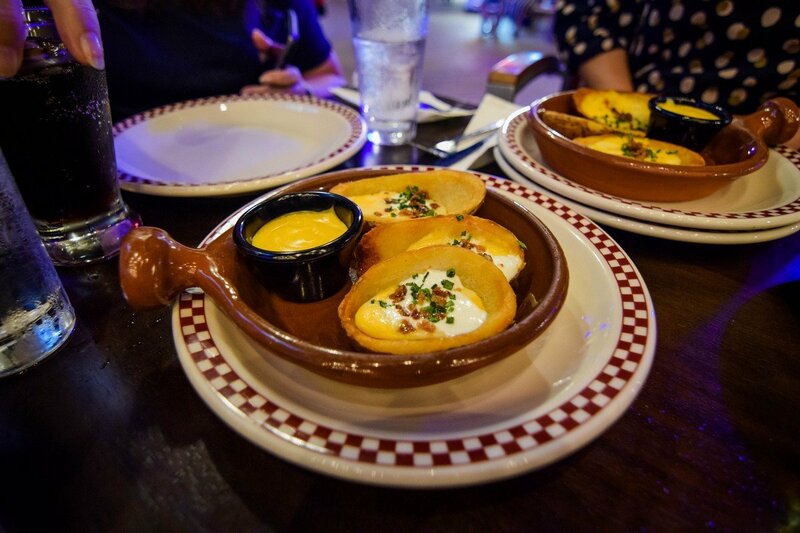 No visit to Chops Grille is complete without a few sides. The sides can feel like a meal, but they offer a great accompaniment to your entrees. I prefer to load up my fork with as many mushrooms as I can fit, alongside a cut of the meat and a dip in the mashed potatoes. Perfection! The new Chops Grille menu has resulted in the removal of the Red Velvet cake. Alas, no restaurant is perfect. 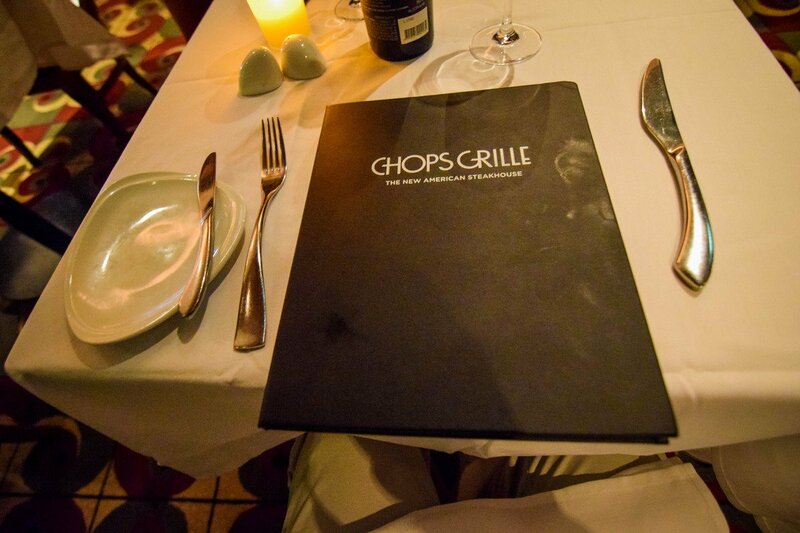 I enjoyed our meal at Chops Grille on Brilliance of the Seas. 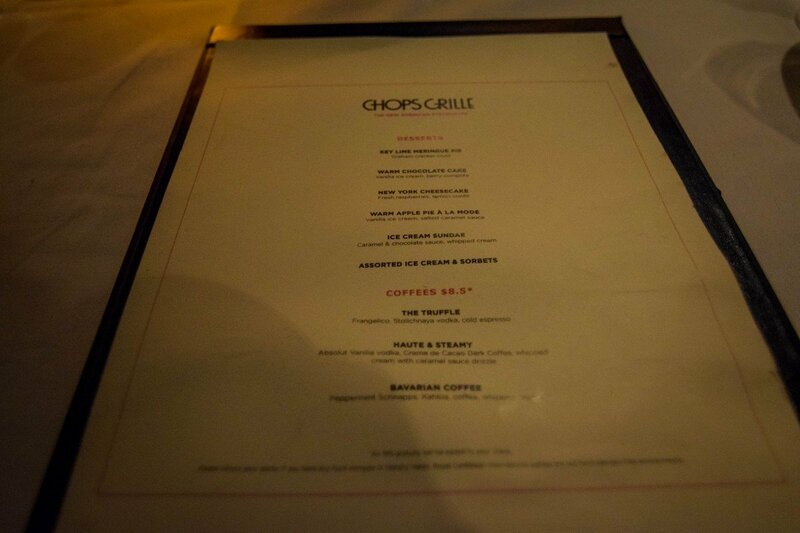 It is easy to see why Chops remains such a popular choice with so many cruisers, based on the wonderful menu. It is important to note that for this visit, we took advantage of a Royal Caribbean dining package, which brough the cost down considerably. The price for Chops Grille continues to push up, so consider a dining package as a way to really save money. For a night out of great dining, Chops Grille is a solid choice for celebrations, date nights, or "the main dining room menu isn't my favorite". What are your thoughts on Chops Grille? Leave us a comment and tell us about it below! It does not take much to convince me to eat at Royal Caribbean's popular Japanese specialty restaurant, Izumi, so when I learned that there was a menu update on Brilliance of the Seas, I just had to try it out for myself. 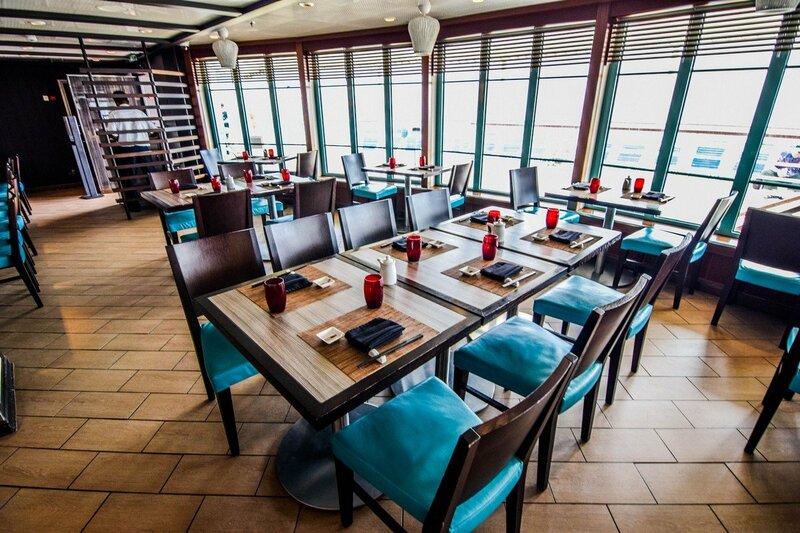 Izumi has spread to much of Royal Caribbean's fleet in just the last few years, and its success has a lot to do with the restaurant's creator and master chef, Chef Travis Kamiyama. Chef Travis spends a great deal of his time visiting Izumi restaurants across the fleet, and trying out new ideas and offerings. Last year, a few new menu options found its way to Izumi, and in the name of research, I took it upon myself to sample these changes. You know, for science! 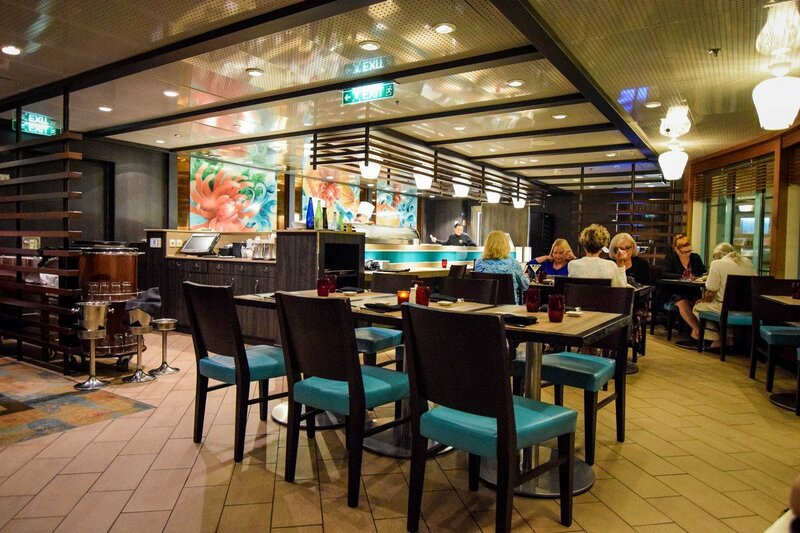 I have dined at many Izumi restaurants across Royal Caribbean's fleet, but the Izumi locations on Radiance class ships are particularly lovely for their location and decor. Izumi on Brilliance of the Seas is located on deck 12 aft, above the Windjammer and near the kids waterslide. Walking into the restaurant, you will find a mostly circular room, with tables lining the outside, a sushi bar, and tables in the interior. In short, there is plenty of seating throughout the restaurant. The seating by the window offers a view out to the ocean, while the booth seating on the back wall features the most comfortable seating. Never hesitate to ask to sit at the sushi bar, where you can watch the sushi chefs at work. The decor of Izumi on Brilliance of the Seas features a lot of dark woods and oranges mixed with bright colors, notably a light blue. 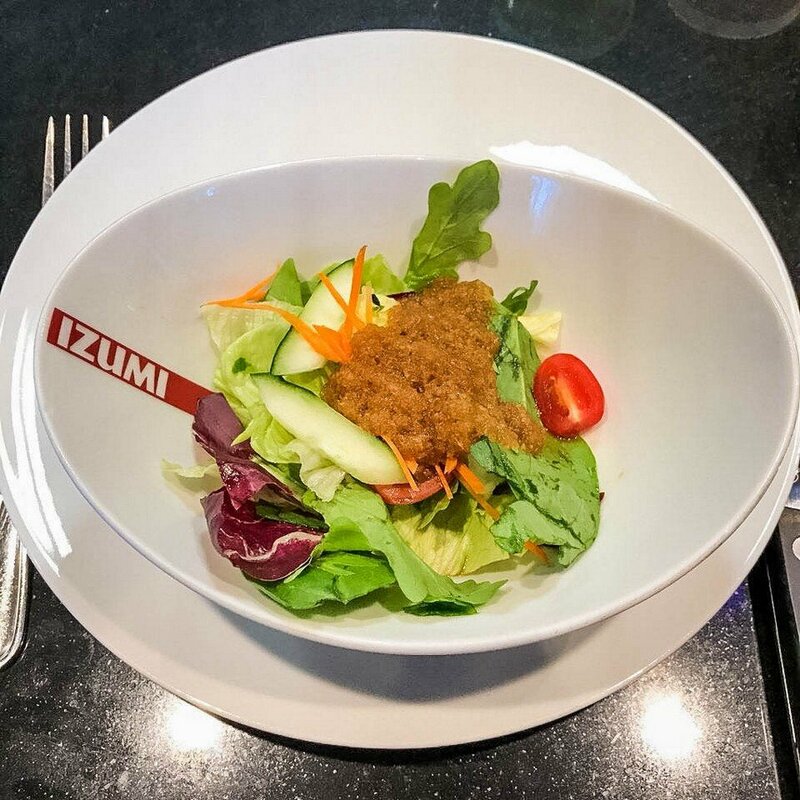 The Izumi menu on Brilliance of the Seas is very similar to Izumi restaurants across Royal Caribbean, but as we mentioned earlier, there are a few new menu items to consider. 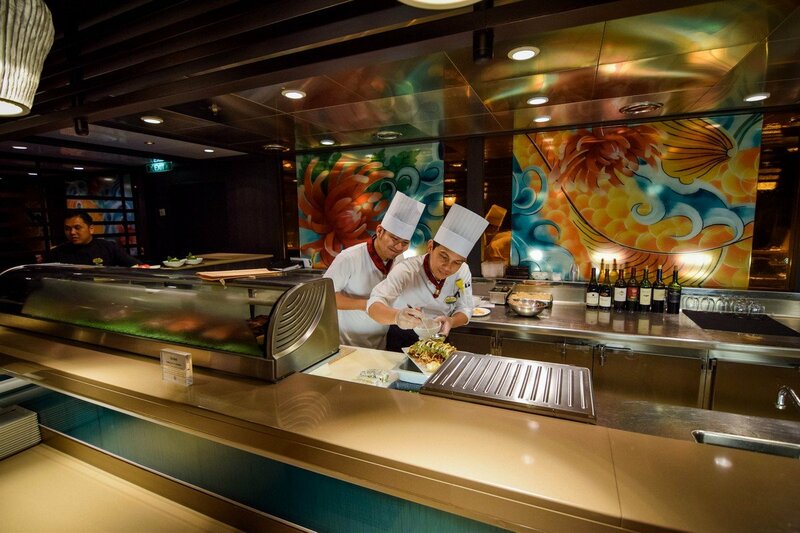 It is also important to note that Izumi on Brilliance of the Seas features a hot rock option, which is incredibly popular among non-sushi eaters. 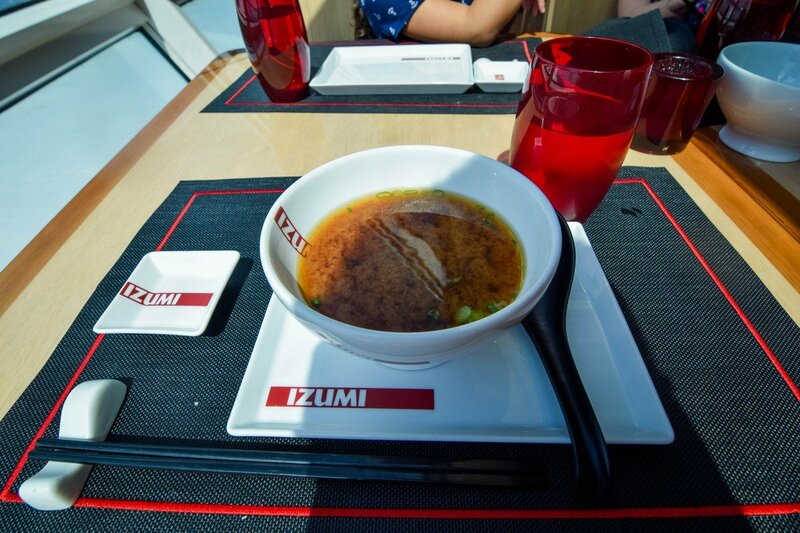 Dining at Izumi is unlike most other Royal Caribbean specialty restaurants, in that there is no cover charge. Rather, you pay for what you order. What is nice about a la carte pricing, is you can drop in for a small bite to eat without fear of overpaying. 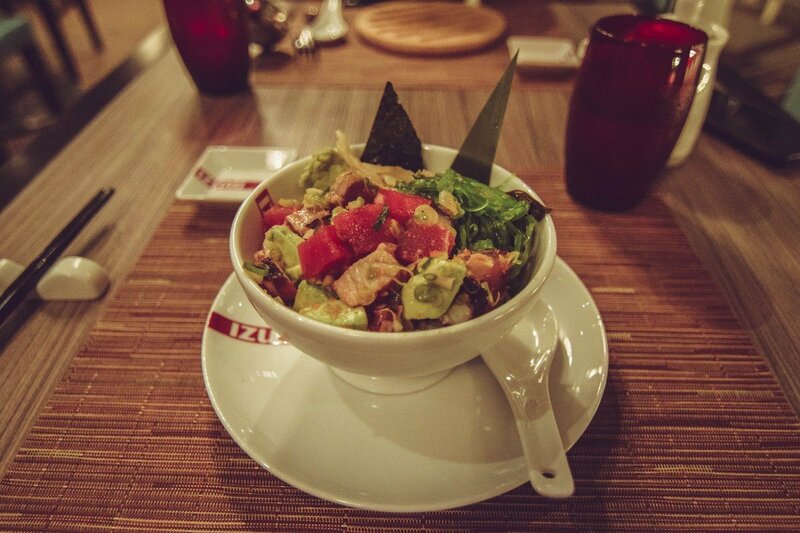 All meals at Izumi begin with a refreshing hot towel and a complimentary bowl of edamame, lightly sprinkled with salt. For this meal, I focused on what was new on the menu. I was a man on a mission, so to speak. You might even say I was hungry for the truth...and for tuna. First up was the Crispy Rice Spicy Tuna, which features creamy tuna on hot crispy rice, topped with a slice of jalapeno. As an appetizer, this is a great starter and easily shareable (not that I offered to share any of this, but theoretically it would be possible). The consistency of the tuna was different than most of the other tuna offered on the Izumi menu, and I am a fan of jalapeno with any of my sushi offerings. I then moved onto the Mixed Poke Taco. 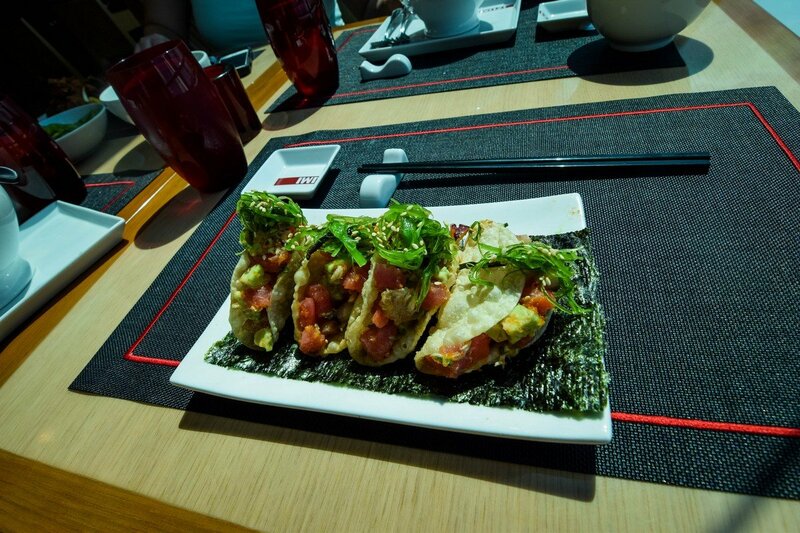 The taco combines tuna, albacore and octopus to form an interesting mix of fish in a crispy wonton shell. I really liked the taco, because you get the tenderness and flavor of the fish, mixed with a rigidness of the taco shell. Combining the two made for another fun and shareable appetizer (note, I did not share this either). Moving onto the entrees, Izumi now offers a Poke Bowl option, which is essentially the exact same ingredients as the Mixed Poke Taco. The Poke Bowl is significantly larger than the tacos, while offering much more of those great ingredients. If you enjoyed the taco and want more, the Poke Bowl is for you. Likewise, if you fear your tablemates may want to try one of your tacos, get the Poke Bowl so you can selfishly devour all the sushi-grade goodness yourself. I also gave the Boxed Yellowtail roll a try, as I did not recall seeing it before. 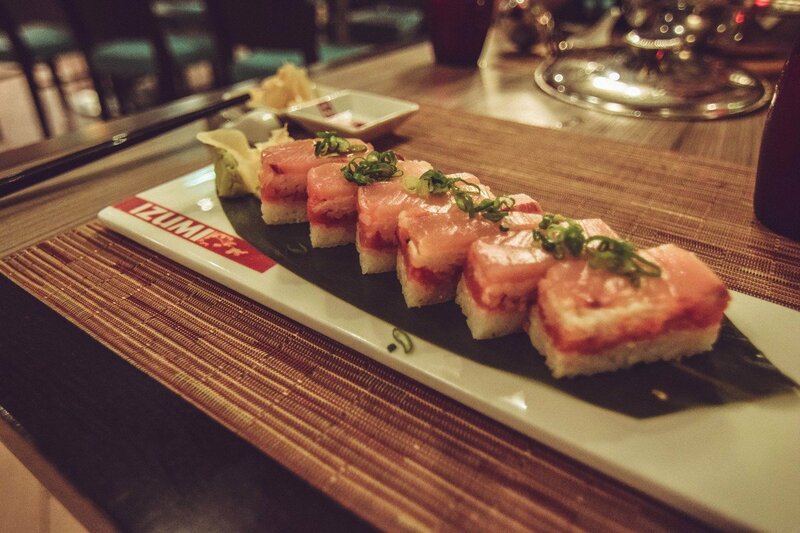 Like the Crispy Rice Spicy Tuna appetizer, this roll also features a spicy creamy tuna terrine, topped with yellowtail sashimi, scallion, and a ponzu sauce. While I was guarding my sushi like a lion protecting its fresh kill on the African Savanna, my wife ordered a hot rock entree. 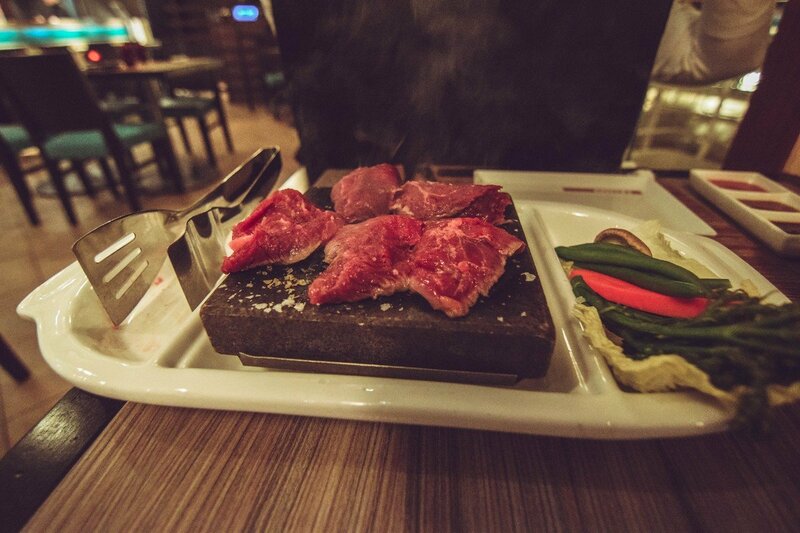 The hot rocks (known as Ishiyake in Japanese), are essentially a really, really hot rock (heated up to 575 degrees Fahrenheit) and served with your choice of protein to be cooked on the rock. With the recent menu change, Royal Caribbean dropped the chicken option, but added some other choices. My wife went with the beef tenderloin, which is thinly sliced beef tenderloin that comes with assorted vegetables. If you are concerned with cooking the meat correctly, your waiter is happy to jump in and assist. It takes just a few minutes to cook the meat to your liking. Plus, it is fun! As someone that loves anything tuna, the new Izumi menu choices were right up my alley. Izumi has always had a strong and varied menu, but these new appetizer choices are a great addition to the menu and theoretically shareable with your tablemates (not that I even considered doing that). 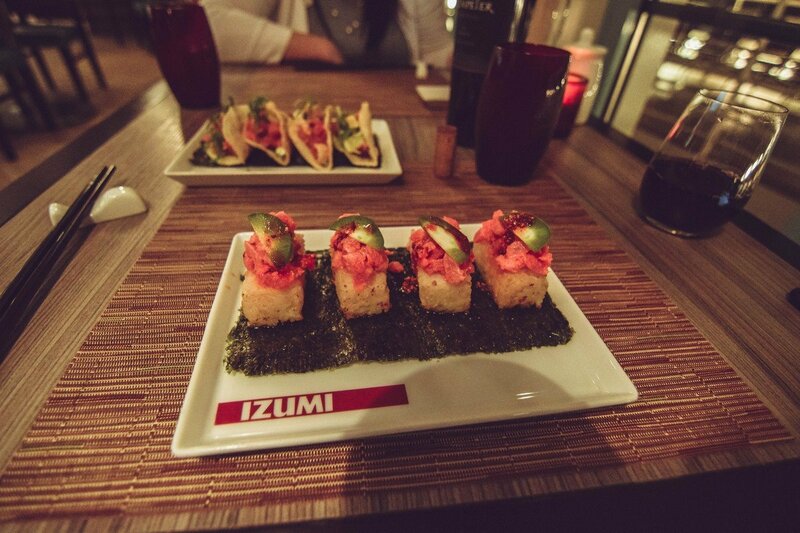 Whether you go for the sushi, hot rocks, soups or anything else inbetween, there is a lot to like while at Izumi. 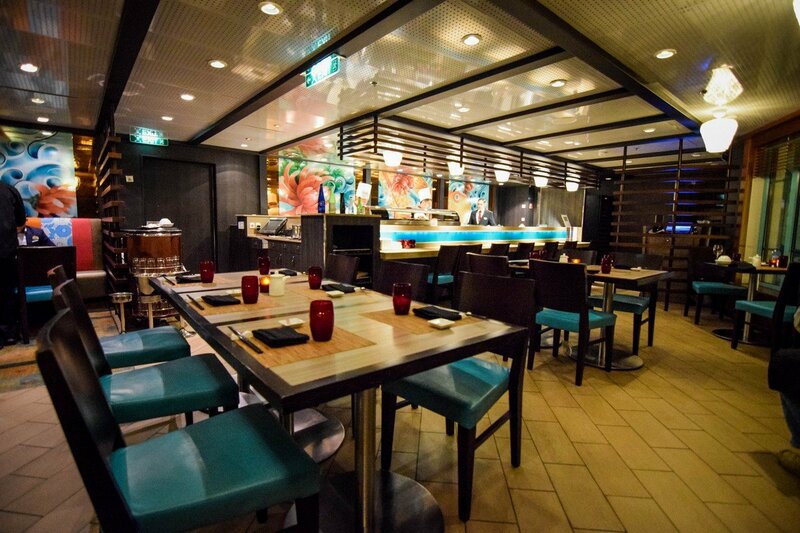 It is a strong menu, and I think fans of Japanese food will enjoy eating here on Royal Caribbean. 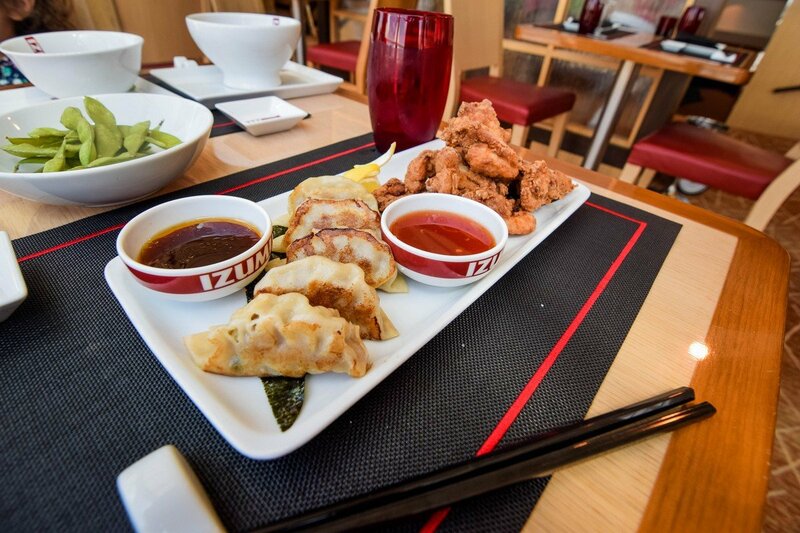 Izumi is open from 12:15 - 1:30pm on sea days for lunch, and 6:00 - 9:30pm for dinner. Royal Caribbean has started to open up specialty dining reservations on some Symphony of the Seas sailings, with Hooked Seafood now providing more detail on what guests can expect. 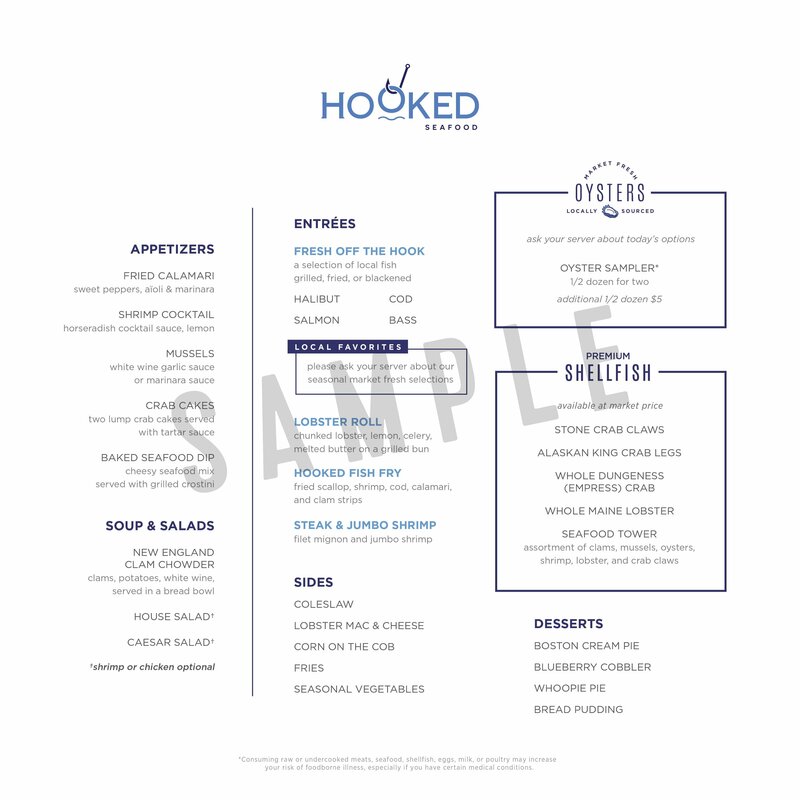 Hooked Seafood was one of the brand new specialty restaurants announced by Royal Caribbean that is coming to Symphony of the Seas. Hooked is described as, "This is the ultimate catch if you’re angling for the freshest seafood. It’s a real taste of New England in a casual atmosphere — and it’s a brand-new addition on our newest ship, Symphony of the Seas. Introducing Hooked Seafood — taste bud-tempting fare to satisfy every seafood craving, including raw bar favorites, a variety of crab claws and a selection of just-shucked East Coast oysters. Plus enjoy classic apps, clam chowder, lobster and fresh caught local fish. It’s reel fresh, real good." The restaurant description on the Cruise Planner mentions your waiter can provide gluten-free, lactose-free, and vegetarian options. Hooked Seafood will be located in the Solarium of Symphony of the Seas. Royal Caribbean cruise ships offer a variety of specialty restaurant choices, and guests have the option of making a reservation in advance. Regardless of when your cruise is, it is always a good idea to book ahead to secure a day and time for your meal. 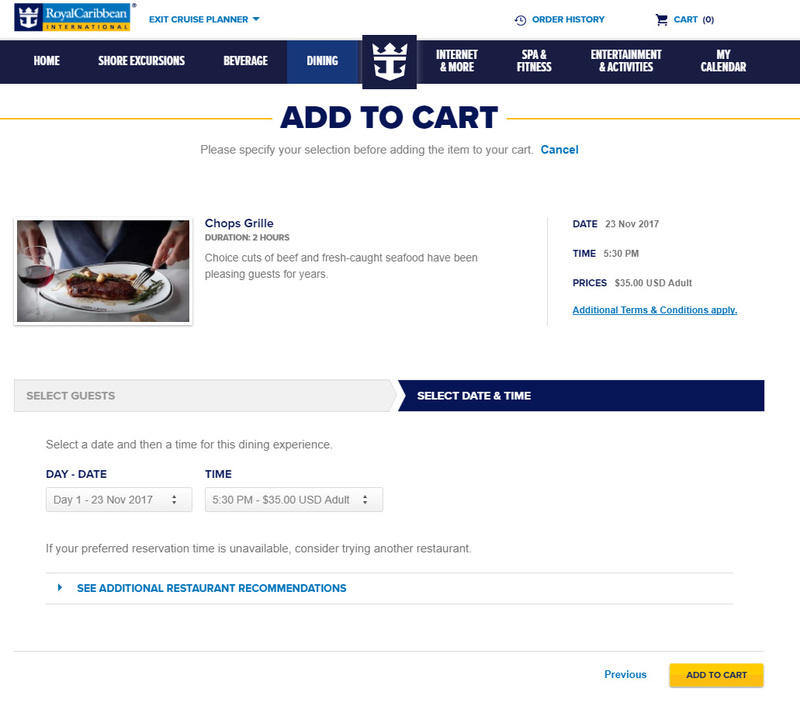 Here is an overview of how to book a specialty restaurant meal for your upcoming Royal Caribbean cruise. Guests can make specialty restaurant reservations prior to their cruise up until 4 days before your sailing date. 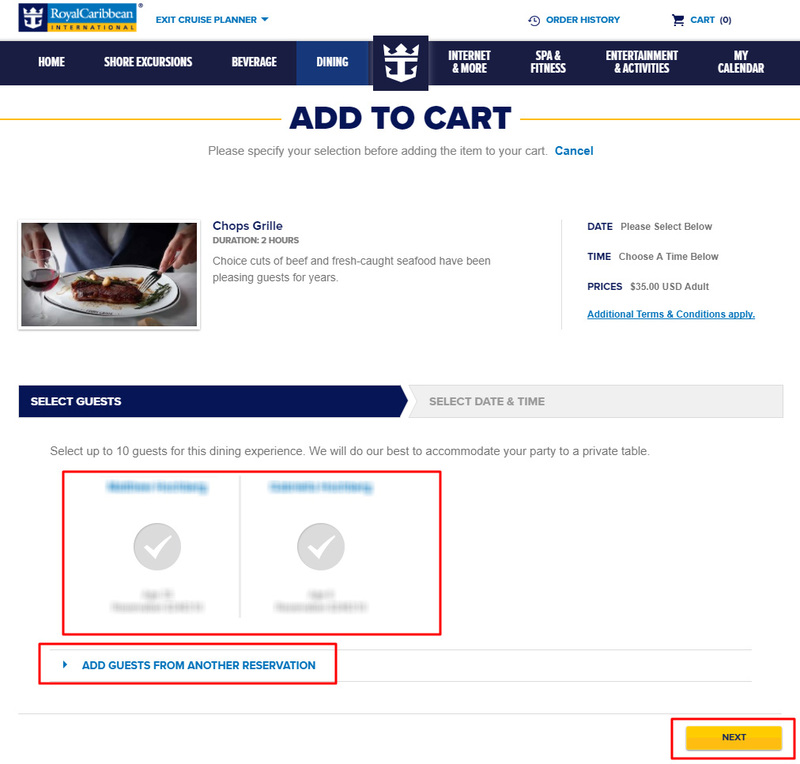 Keep in mind that Royal Caribbean does not allow specialty dining reservations to be made until you reach amount of days that are left until your cruise. If you do not see the option to reserve specialty restaurants, check back later. In order to make specialty restaurant reservations online, you will need to pay any cover charges that may exist at the time of booking. Booking specialty restaurants in advance offers you the opportunity to lock in exact day and times for meals as well as being able to space out the total cost of the cruise. 1. 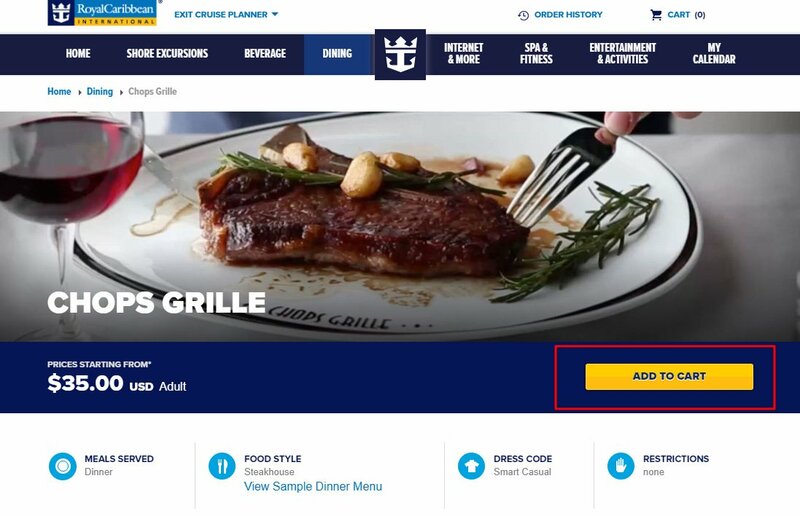 The first step in booking a Royal Caribbean specialty restaurant is to go to RoyalCaribbean.com and click LOG-IN from the top right navigation. 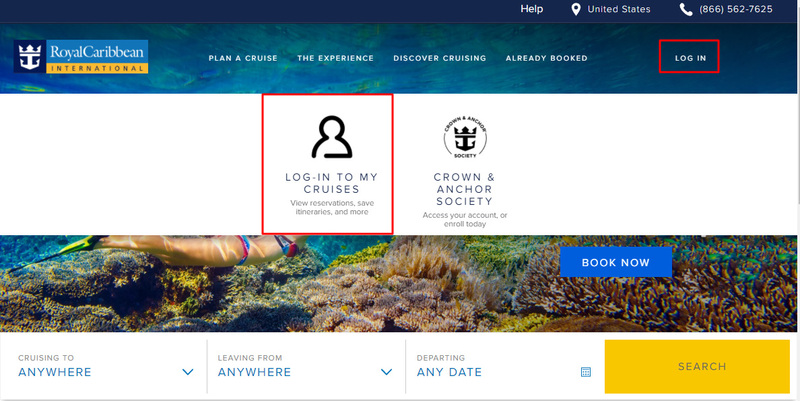 Then click LOG-IN TO MY CRUISES. 2. 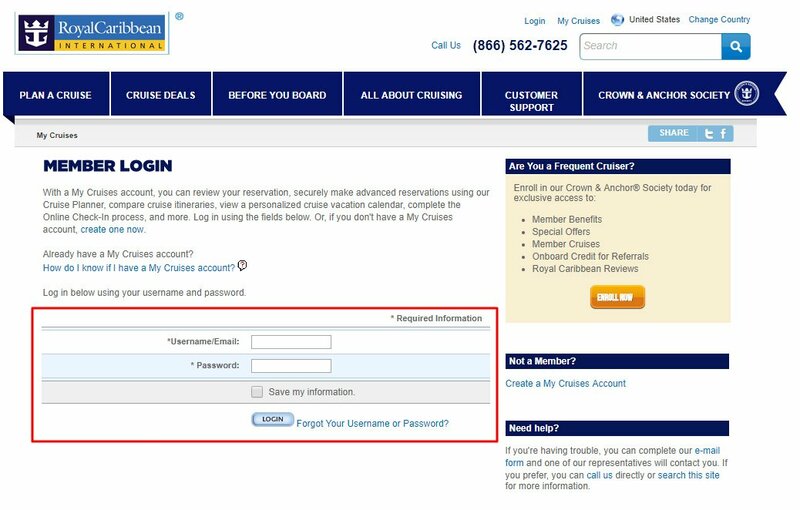 Log into My Cruises with your Royal Caribbean username and password. You will need to have an account with Royal Caribbean (free) and have linked your upcoming cruise with your account. We won't cover how to do this in this article, but I will assume you have done this earlier. 3. 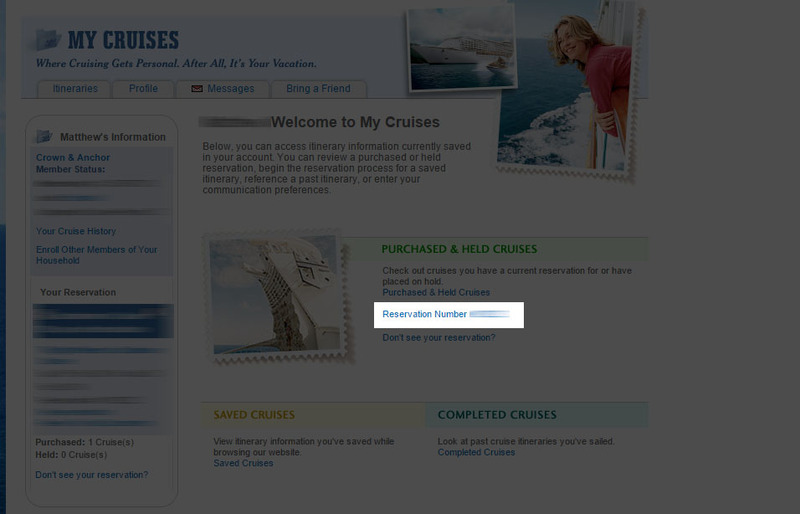 Once logged in, click on the Reservation Number for the cruise you want book a specialty restaurant. It will be located in the middle of the page under PURCHASED & HELD CRUISES. 4. 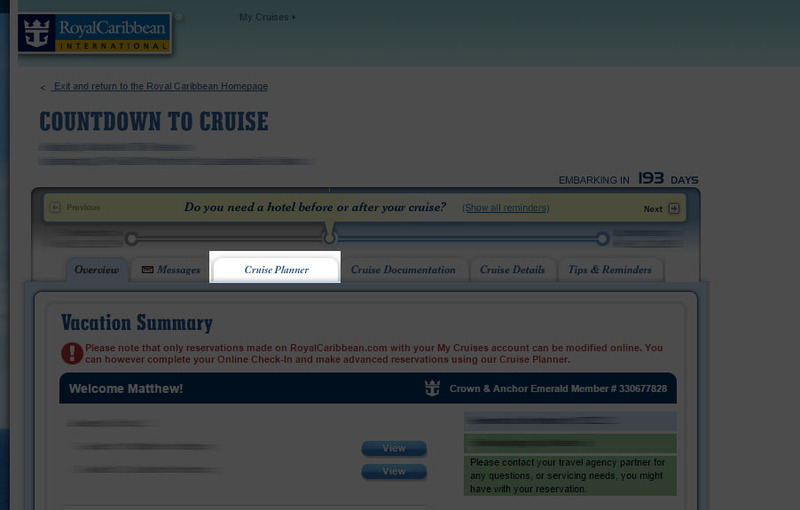 From the top navigation, click on Cruise Planner. 5. 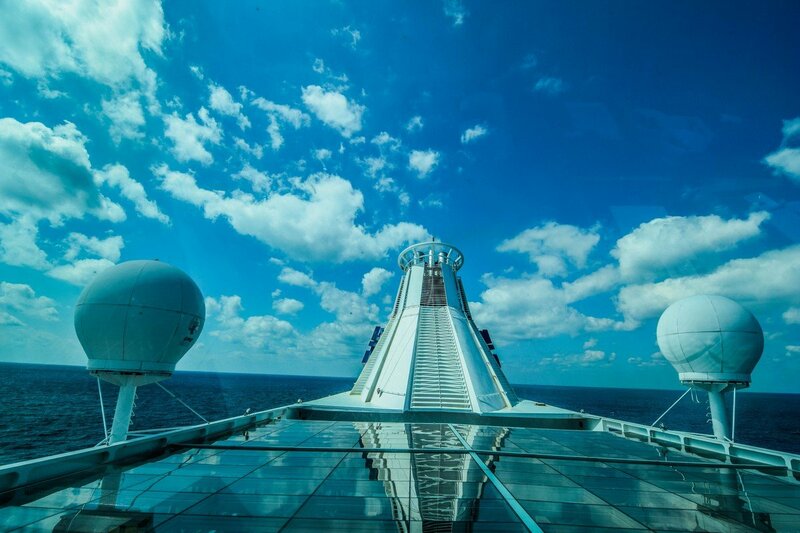 Click on the GET STARTED button to bring you to the Cruise Planner. 6. Click DINING link in the top menu. 7. Select the restaurant of your choice. You will be able to read more about the restaurant, see a sample menu, and get pricing details. 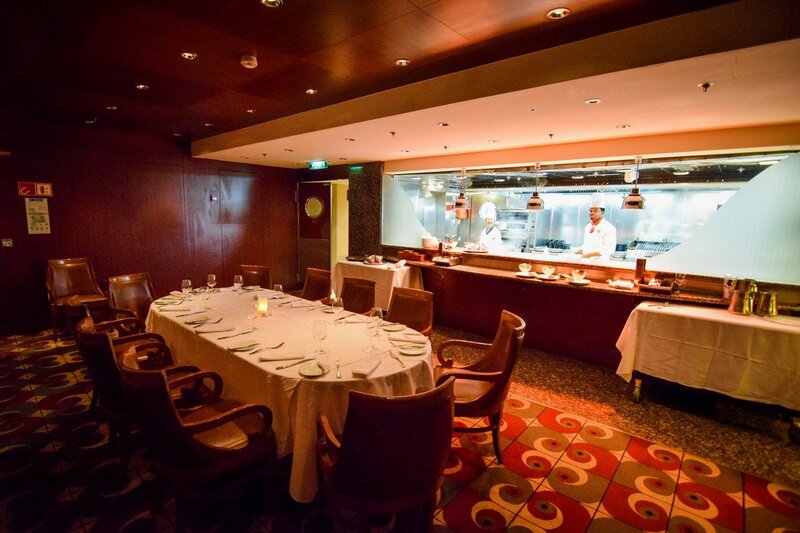 We keep an archive of Royal Caribbean specialty restaurant menus for your reference. 8. Read the description of the restaurant, menu and more and when you are ready, click ADD TO CART button. 9. At this step, you will select which guests in your booking will be joining you. Just click on each guest's name to add them to the reservation. Optionally, you can add other guests from another reservation via the ADD GUESTS FROM ANOTHER RESERVATION link at the bottom. For this feature, you just need their last name and their reservation number. When you're ready, click NEXT button at the bottom right. 10. For the next step, you will select the day and time for your reservation. Select the DAY dropdown field first and then choose from the available times from the TIME dropdown. When you are satisfied with the date you picked, click ADD TO CART. 11.You have added your reservation to your shopping cart succesfully and now can either CONTINUE SHOPPING and add other items to your shopping cart, or click CONTINUE CHECKOUT and enter your payment information to finish your purchase. If you are on your cruise or have less than 4 days until you go on your Royal Caribbean cruise, then you will need to make a reservation for the specialty restaurants onboard your cruise. Via a Royal Caribbean smart phone app (Royal iQ or Royal Caribbean app). The app is currently limited to select ships. 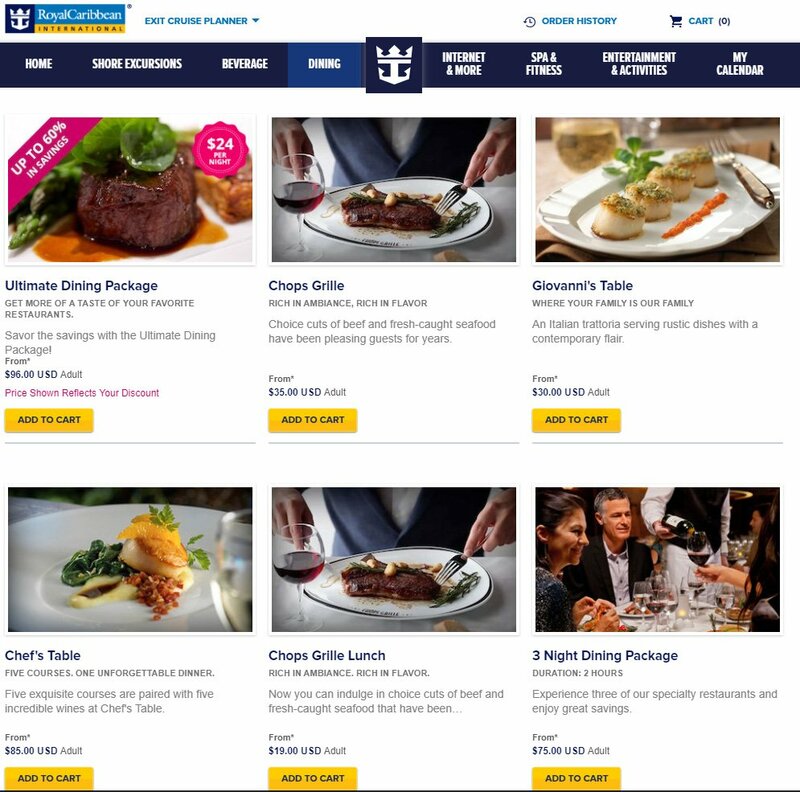 Any dining reservations you make online via the Cruise Planner are fully refundable. If you change your mind or want to change restaurants or even dates, it is easy enough to cancel and rebook. Do not make specialty reservations for children. Children between the ages of 0-5 are complimentary and ages 6-12 are half the adult price. 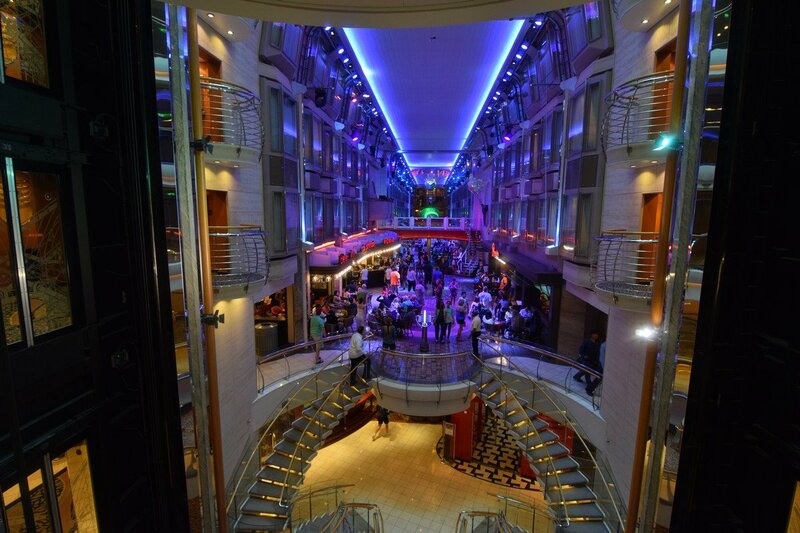 Royal Caribbean recommends making a reservation for all guests who wish to dine. Adult price will be applied for all guests regardless of age; the difference between the adult price and child price will be refunded in the form of a refundable onboard credit (unless booked with non-refundable credit, in which case OBC will be non-refundable). 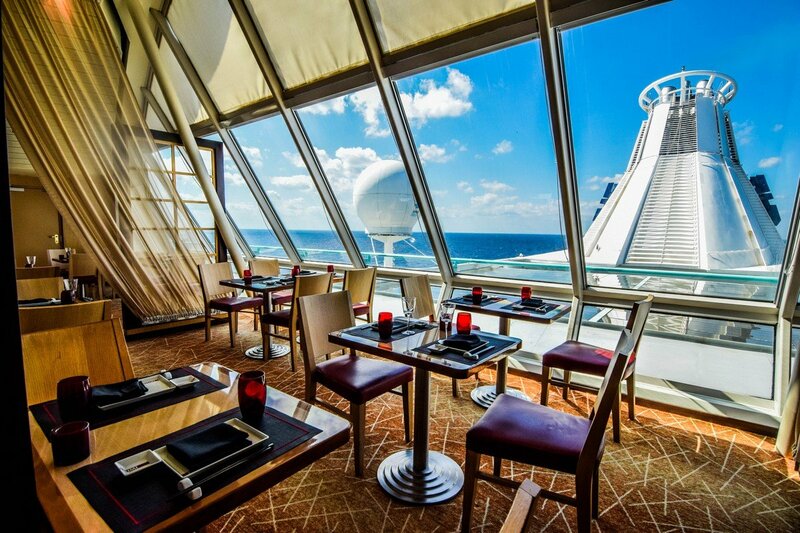 If your cruise is too far out, you may not see dining reservations available. Keep checking back closer to your sail date. There is no set amount of days prior to a cruise when specialty restaurants appear, so check periodically. For more Royal Caribbean dining information, such as what food is included with your cruise, drink package options, dining packages, and more, visit our Royal Caribbean food overview page. 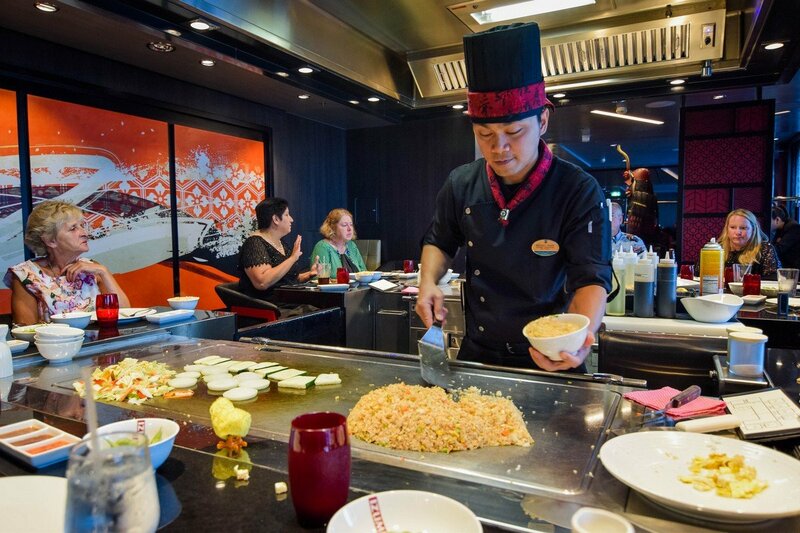 I have reviewed a lot of Izumi restaurants on Royal Caribbean ships, but I had never tried the relatively new hibachi option that Royal Caribbean added not too long ago. 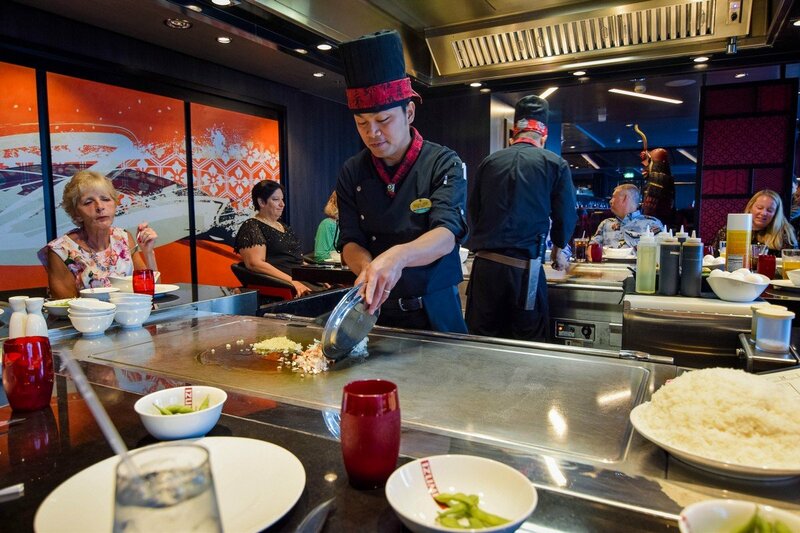 Izumi's teppan style dining is offered only on the Oasis Class ships, but I had never dined at any of them. 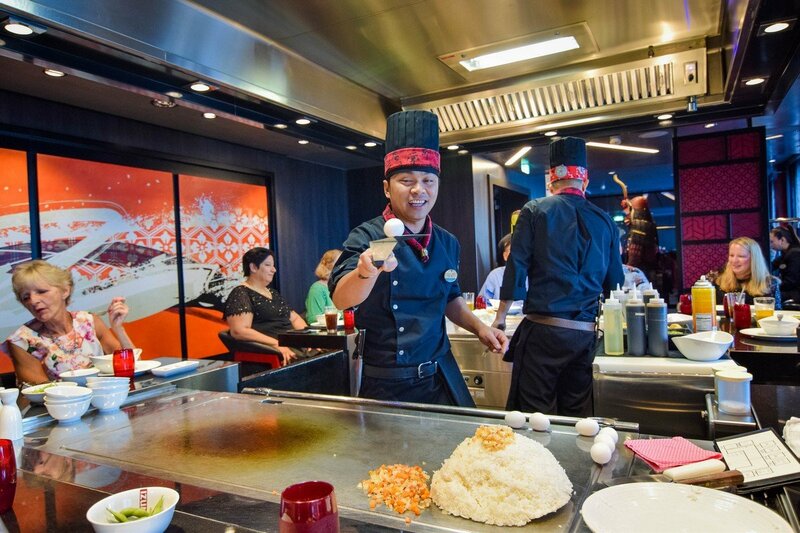 Sure, I have eaten at many hibachi restaurants on land, but I never had the opportunity to try Izumi's take until our recent Harmony of the Seas cruise. We headed down to deck 4 to try it out for ourselves. Izumi hibachi is a teppanyaki-style restaurant, which is sometimes referred to as a “Japanese steakhouse." 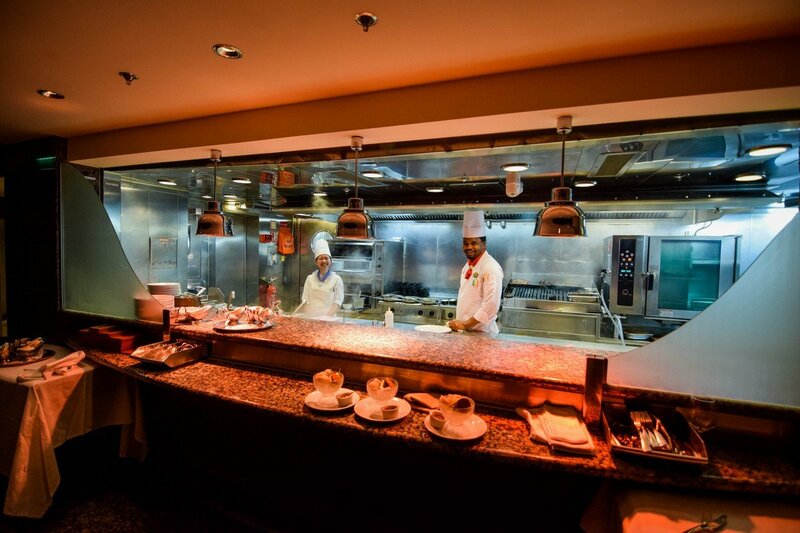 Made famous by Benihana restaurants, the experience combines cooking and service into one fun performance. 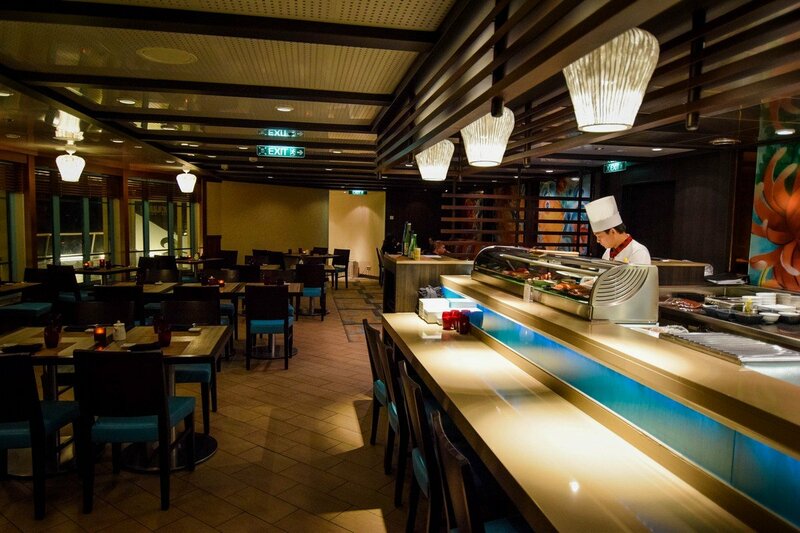 On Oasis Class ships, Izumi is split into two restaurants: the sushi side and the hibachi side. Reservations and availability are exclusive to each other, with often the hibachi side booking up quite quickly because of the limited space and high demand. 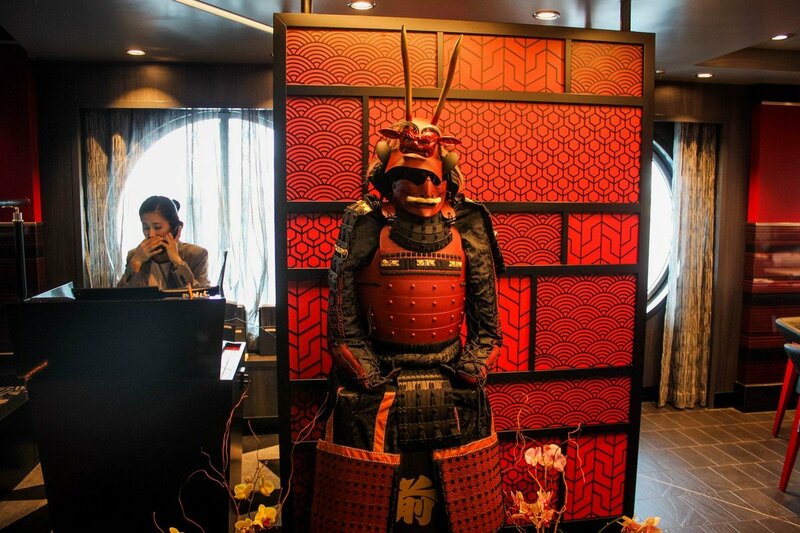 Located on deck 4, Izumi is to the right of the Silk main dining room and around the corner from the entrance to the casino. 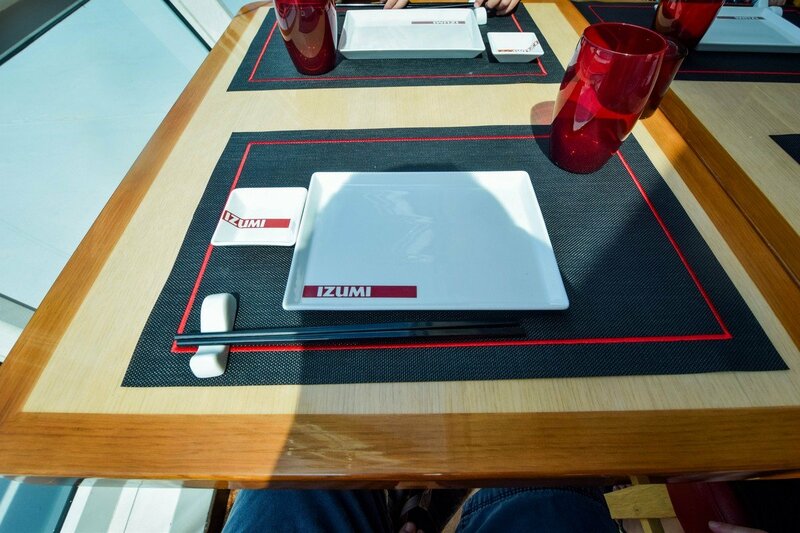 The decor of Izumi is comprised of dark reds, browns and blacks. 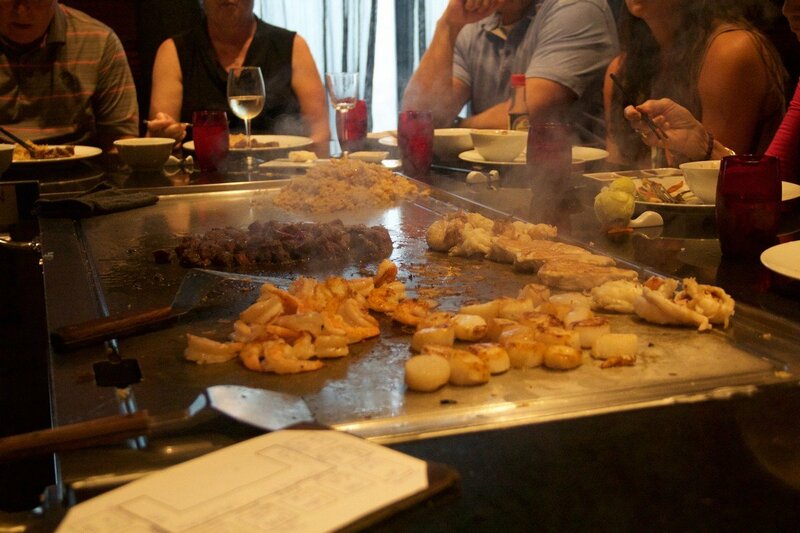 The hibachi area is made up of three cooking tables, surrounded by chairs for guests to sit on during their meal. Each cooktop is a communal table that can accommodate up to eight guests, with the chef at the center of the table doing the cooking. Remember, since seating is communal, you will be seated with strangers unless you have 8 people in your party. Soon after we were seated, our server greeted us. Since our food would be prepared before us by a Chef, the server's primary role would be to take our drink and food orders and take care of us throughout the meal. The Izumi hibachi menu is comprised of two basic choices. There are the Teppan Classics, which offer a choice of Chicken Breast, Beef Tenderloin, Tiger Shrimp or Tofu for $45 per person. Alternatively, you can opt for the Teppan Premier Combo at $49, which offers the option to do combos (half of one meat and half of another), as well as the choice of lobster, sea scallops, and NY Steak. All hibachi meals include Edamame, a salad, and choice of vegetable fried rice or brown rice. In addition to the teppenyaki options, there are also a some appetizer and sushi options rounding out the menu. Our chef soon took the stage and introduced himself. After he confirmed our orders, he set to work preparing dipping sauces for the meal. These go out to everyone in individual servings, and include three dipping sauces: Sweet Chili, Teriyaki, and Ginger Onion. 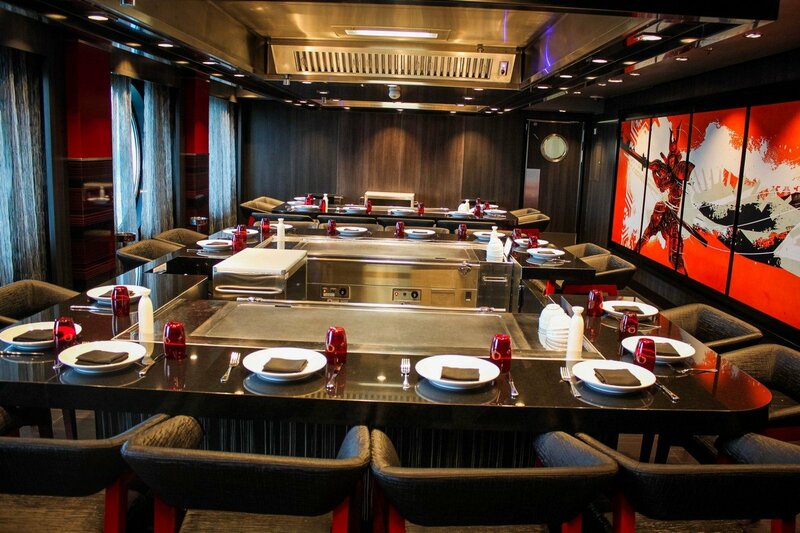 As is common with nearly all teppanyaki meals, the grill preparation and cooking is incorporated into a show, where the chef includes a number of tricks, jokes, and flamboyant demonstrations to keep everyone at the table entertained. Our chef did many of the tricks that have made Japanese steakhouses so popular. If you have been to a teppanyaki restaurant before, some of the tricks may be familiar to you, while others were a surprise to me. Speaking of tricks, there is no fire incorporated in any aspect of the cooking, so no onion volcano tricks here. Soon, the cooktop was full of meats, vegetables, and rice. This part of the meal is what brings people back time and time again, because it just so darn fun to watch. I made two visits to Izumi, and the first time ordered just the chicken. The chicken was great, but on my second visit, I opted for the chicken and steak combo. I can say with certainty paying $4 more for the combo made the meal that much better. 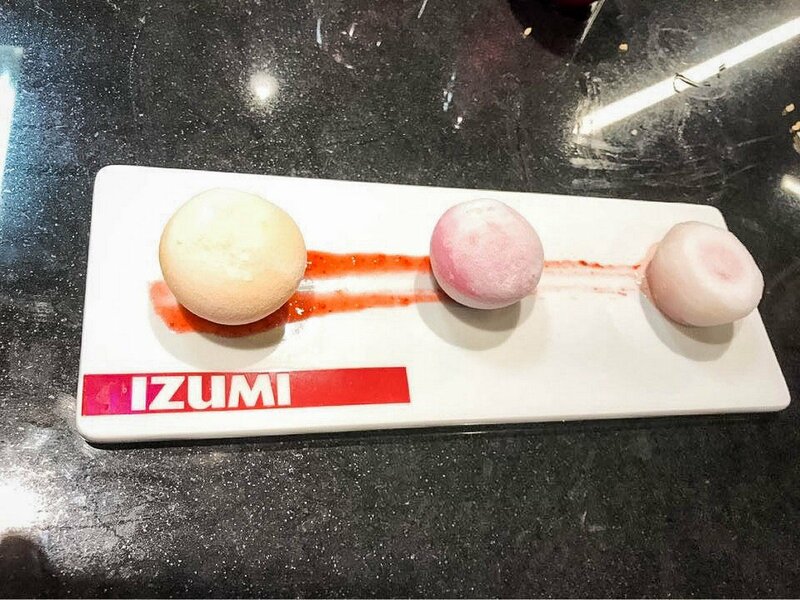 Dessert is also included with your meal, and by far the Mochi ice cream is a favorite. Mochi is best described as, "ice cream dumplings" and is worth a try. Having dined at Izumi Hibachi, I can see why the reservations are as hard to come by as they have been. The servers who take care of you here are warm and friendly, and the chefs are the best of the best at what they do. Food is always cooked well, and entree portions are generous. As a bonus, I really like that I can see my food before and during the cooking process. What other type of restaurant ensures that you know first hand how fresh your food is? Plus, you get a show! 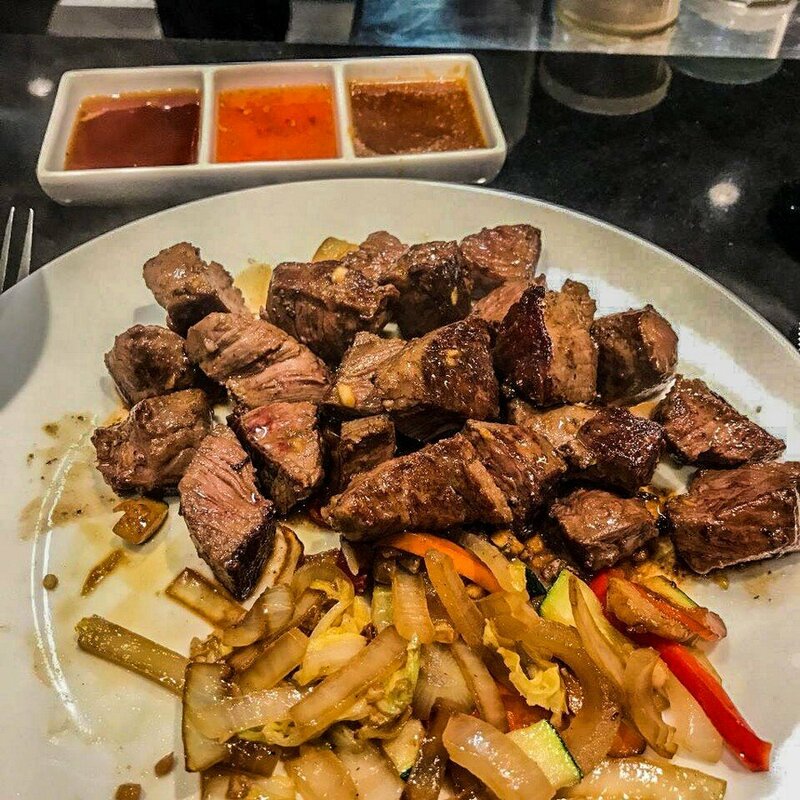 Moreover, the variety of food choices makes Izumi hibachi a great choice for groups because it can satisfy a wide range of tastes and preferences. I also brought my six year old daughter with us, and this meal is by far the most succesful specialty restaurant experience we have had with her. Usually she gets bored quickly, due to the length of the meal, and she also tends to be too picky to make many specialty restaurant experiences "worth it." At hibachi, she loved every second of it and insisted we bring her back on the second evening we dined there. Overall, I can recommend Izumi hibachi to Royal Caribbean cruisers who seek a fun dining experience that also has some really good food. Cost: The cost for Izumi hibachi on Harmony of the Seas is $45 per guest for dinner, or $49 per guest if upgraded menu selected. Do you love Izumi hibachi? Leave us a comment below and share your favorite experiences! 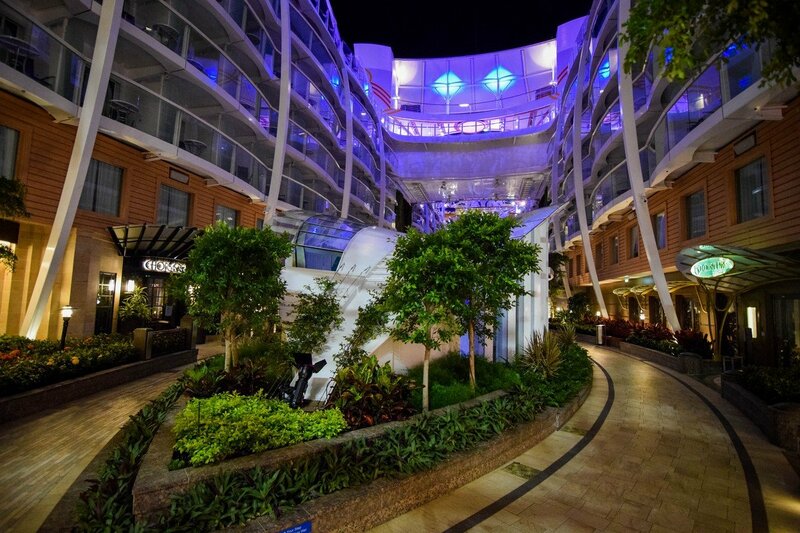 On a recent Harmony of the Seas cruise, we took the opportunity to try Chops Grille. With dining packages becoming so popular, we decided to visit the Royal Caribbean specialty restaurant of all time (historically speaking). Chops Grille is located on deck 8 in Central Park. 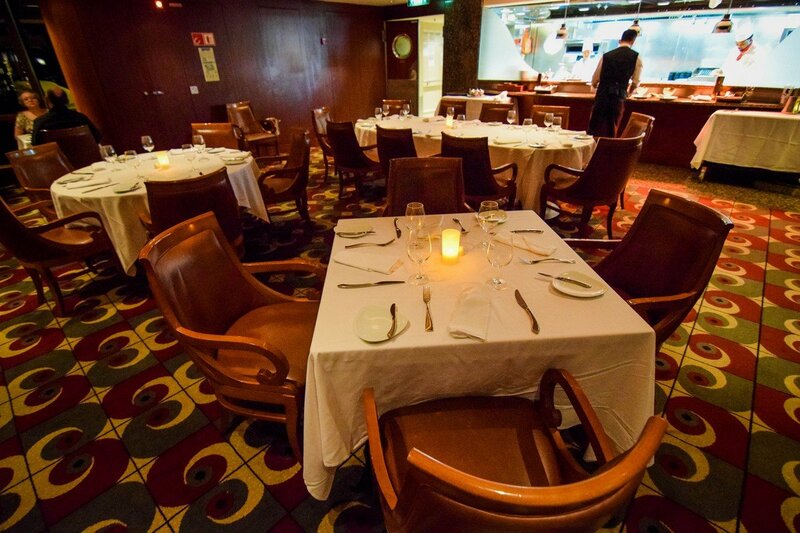 Having dined at Chops Grille on a number of other ships, it has always been a reliable and delectable restaurant. The ambiance alone is worth the reservation. Guests have the option to dine inside or outside, although the weather may dictate how viable the outdoor seating is for your enjoyment. 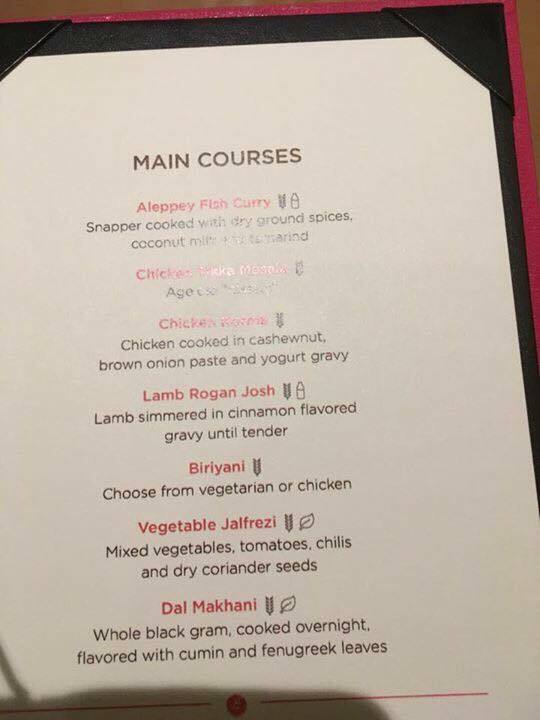 The Chops Grille menu on Harmony of the Seas features the "classic menu", as opposed to the new Chops Grille menu that is starting to make its way around the fleet. 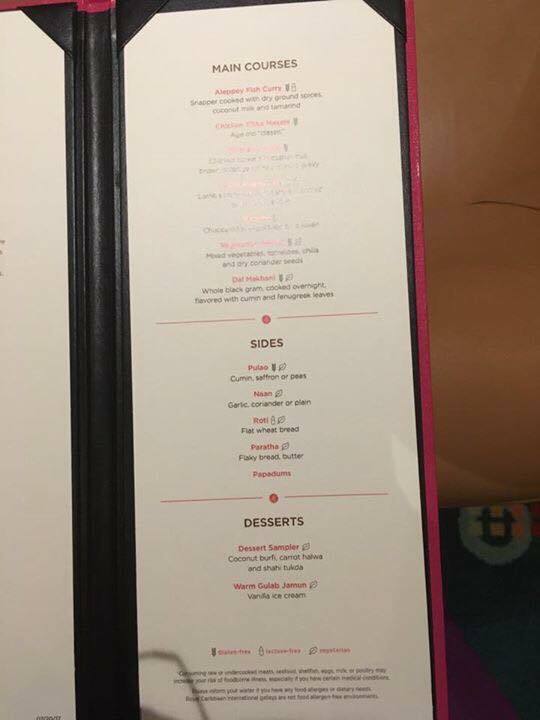 The differences are mostly minor, but it is worth noting that the dinner menu may change soon too on Harmony of the Seas (if it has not already). 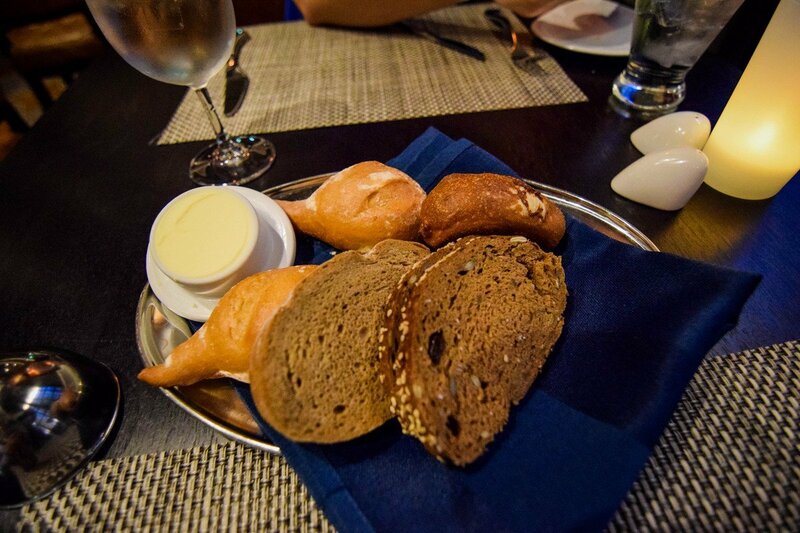 Every Chops Grille meal begins with a serving of breads and butter. I enjoyed the different choices, with the hard roll being a favorite. My favorite appetizer is the French Onion Soup, which is served with a generous amount of onions underneath a cheese and bread topping. 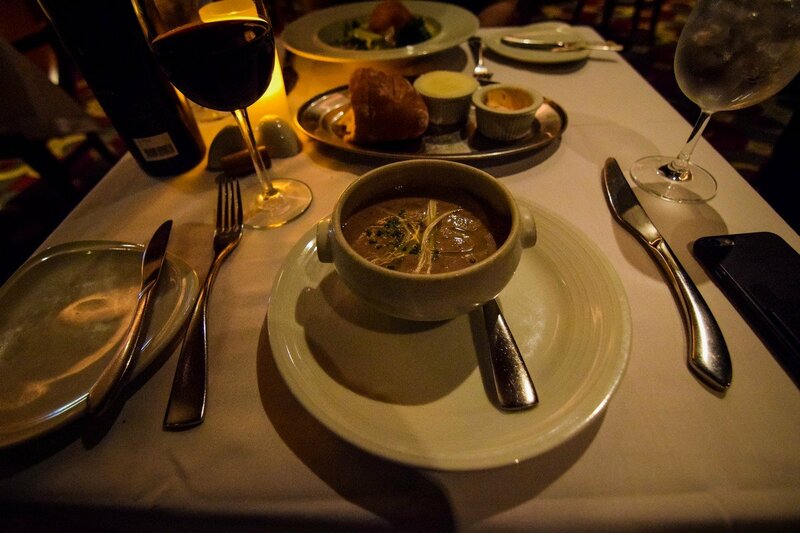 You can find French Onion Soup in the main dining room, among other places, and I really think the French Onion Soup from Chops Grille is the best. 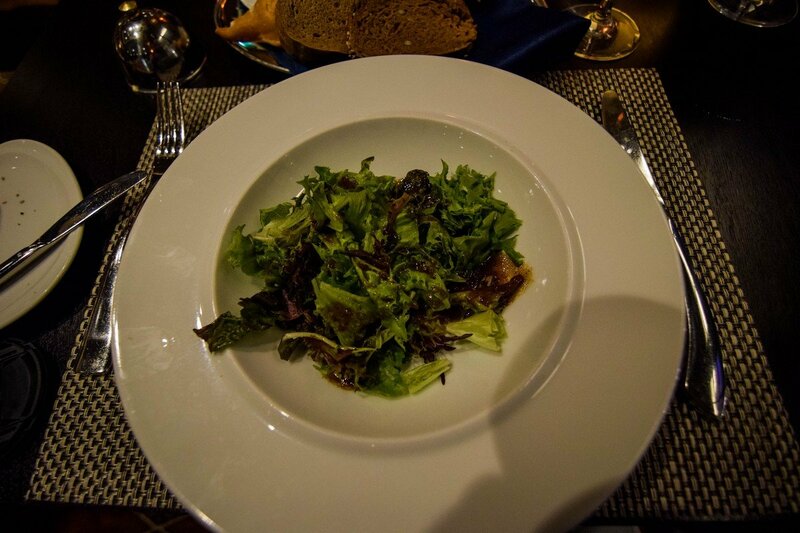 We also tried the mesculun salad, which has a very good balsamic dressing. Not too rich or overpowering, and the greens were fresh and crunchy. Of course, the star attraction at Chops Grille are the steaks. 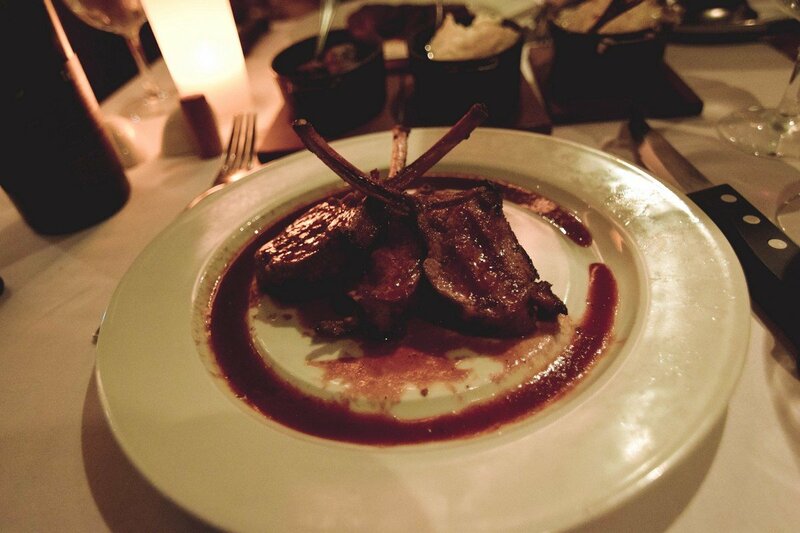 Guests have the choice of a number of cuts of meat, including dry age steaks that cost extra. Having tried the dry aged steaks on Anthem of the Seas, I felt confident in sticking with a tried and true Chops Grille favorite: the filet mignon. While I might sometimes prefer the NY Strip steak for the flavor, the tenderness and lean cut of the filet mignon always makes it a great choice. Like so many other times at Chops Grille, the steak was cooked exactly the way I wanted it. 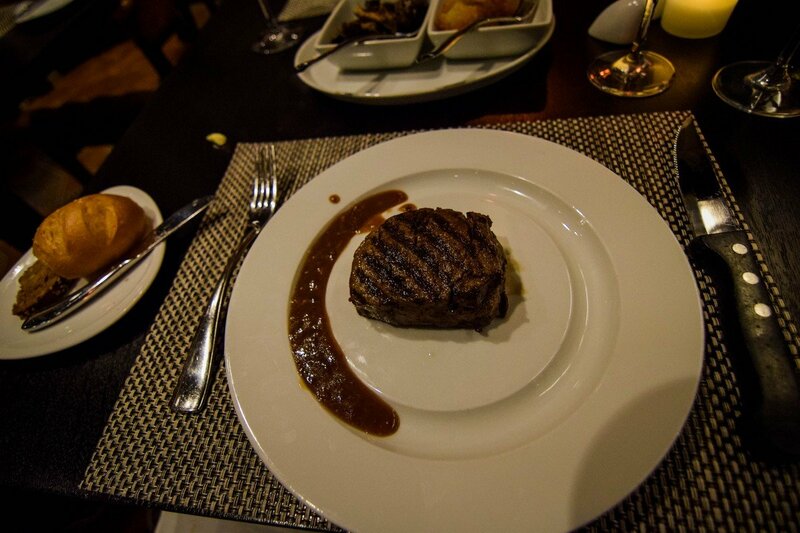 Your waiter will also provide a choice of steak sauces to add, such as a bearnaise sauce. 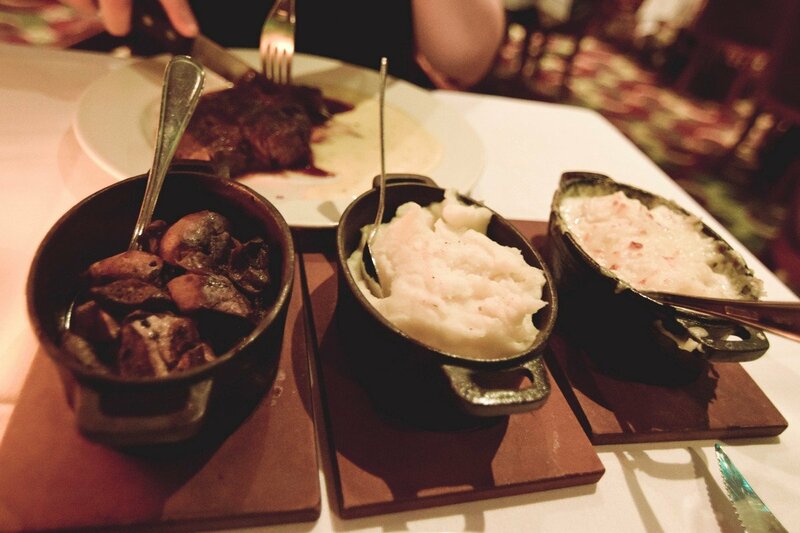 Of course, the sides you can order at Chops Grille really enhance the main course. 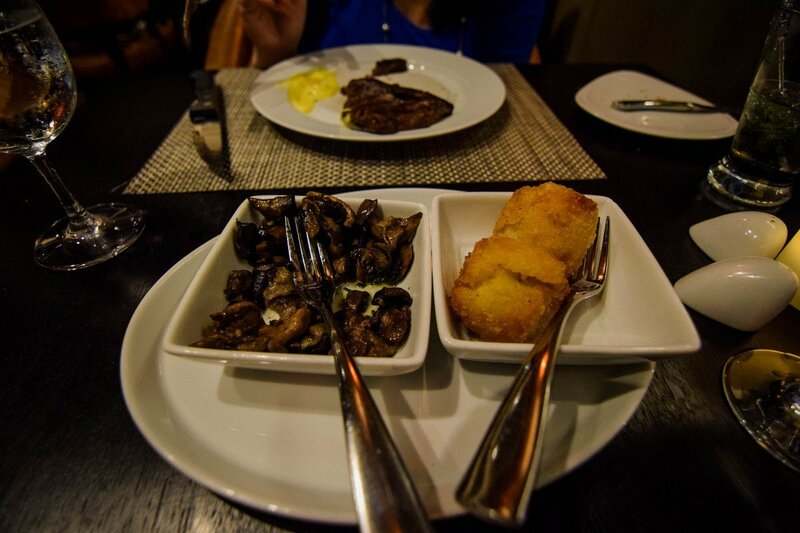 We tried the roasted mushrooms and Gruyère Cheese Tater Tots. I could probably be satisfied with a meal consisting just of the mushrooms, so combining the mushrooms with the steak is a recipe for one happy blogger. For dessert, I traditionally order the red velvet cake, but decided to try something different this time. 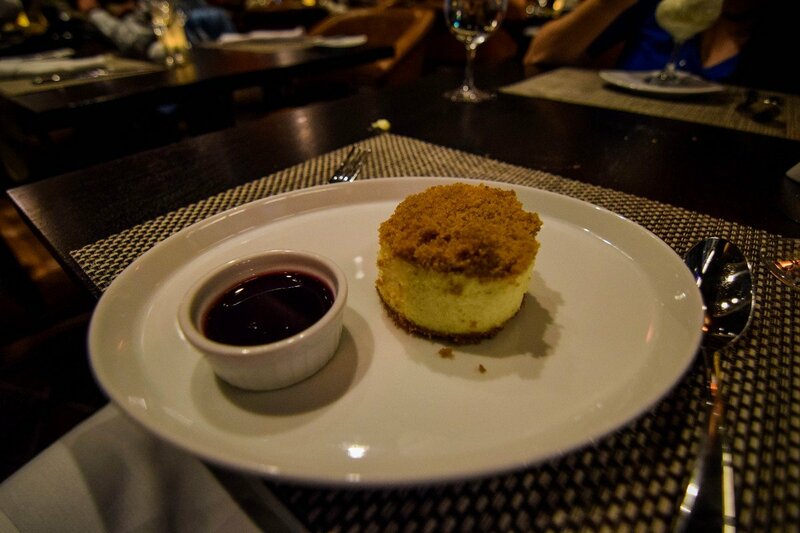 The Huckleberry Cheesecake is a relatively new dessert option that many really enjoy. I opted to have my Huckleberry sauce on the side just so I could manage the cake to sauce ratio (I prefer a hint of sauce, rather than a dousing). Having dined at Chops Grille for many years, on many ships in Royal Caribbean's fleet, I can safely say that the Chops Grille experience remains a quality dining experience. The consistency of the food and service is excellent, and dining at Chops Grille in Central Park adds another level to the overall experience. While I may have preferred the beef tenderloin from 150 Central Park, I certainly did not regret my Chops Grille meal in the least bit. 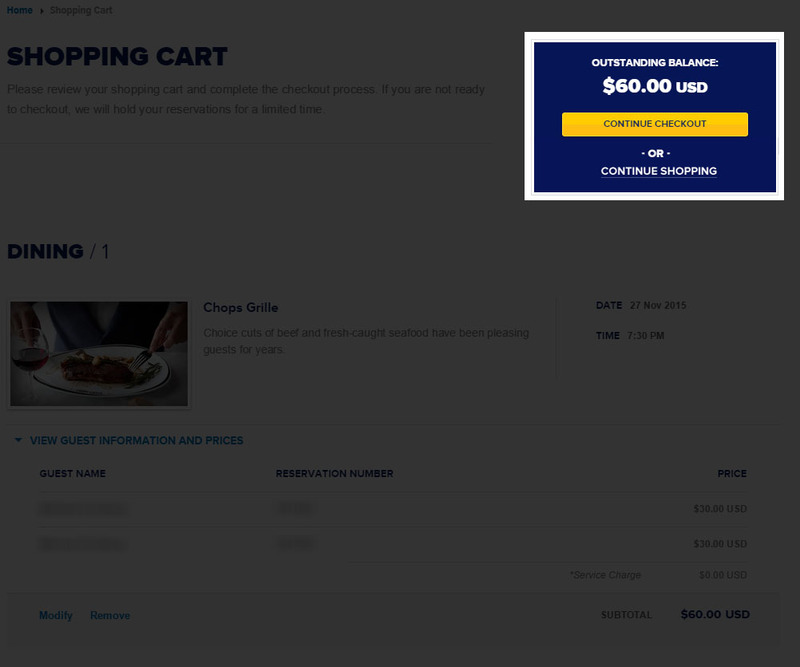 There is one consideration about dining at Chops Grille on Harmony of the Seas, and that is the price. These days, dinner at Chops Grille will run $49 per person, which is a lot for any specialty restaurant. If you have sticker shock about it, the best strategy is to consider a dining package to help bring the cost down. Dining packages will cost you more in total out of pocket, but the per dinner experience is typically slashed considerably and that makes the value of Chops Grille far better. 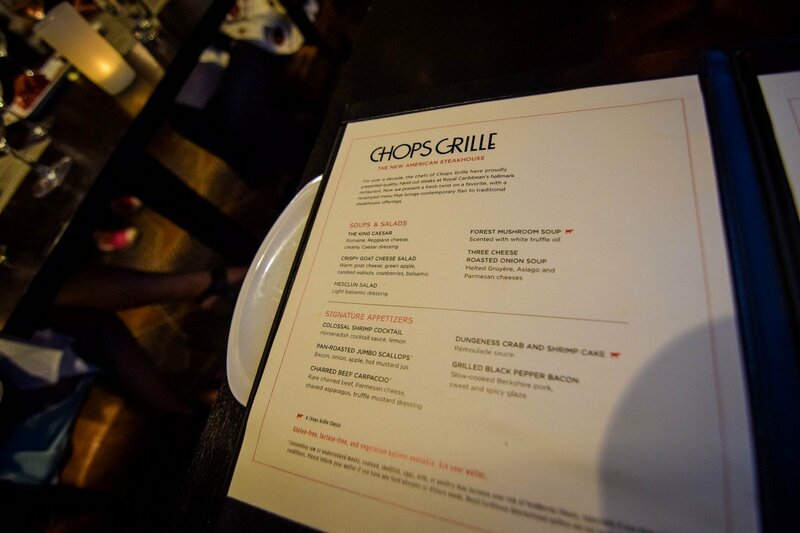 If you have dined at Chops Grille many times as well, you will find Chops Grille to be a familiar choice and very similar to other Chops Grille restaurants across the fleet. If you are new to Royal Caribbean, Chops Grille is a solid choice for anyone that wants a really good specialty restaurant experience. 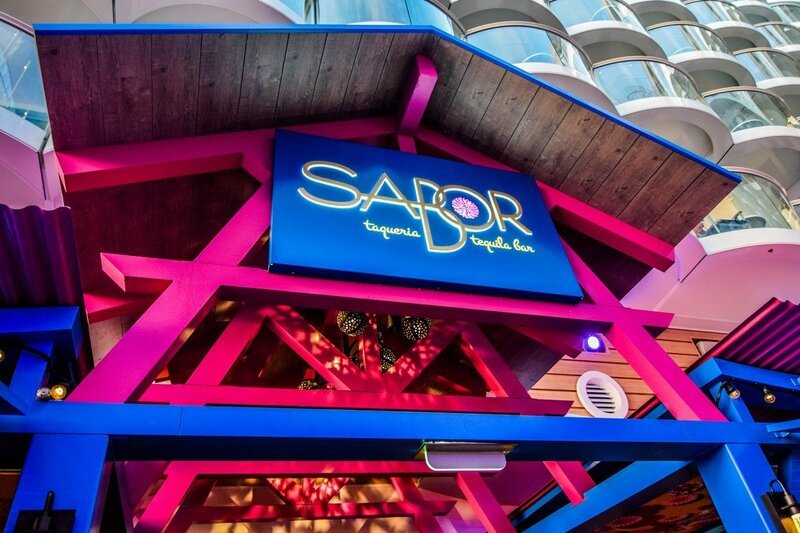 While Royal Caribbean's Navigator of the Seas is offering cruises from the United Kingdom this summer, the cruise line has temporarily changed Sabor Modern Mexican to Sabor Indian Cuisine to cater to the tastes of its British cruisers. 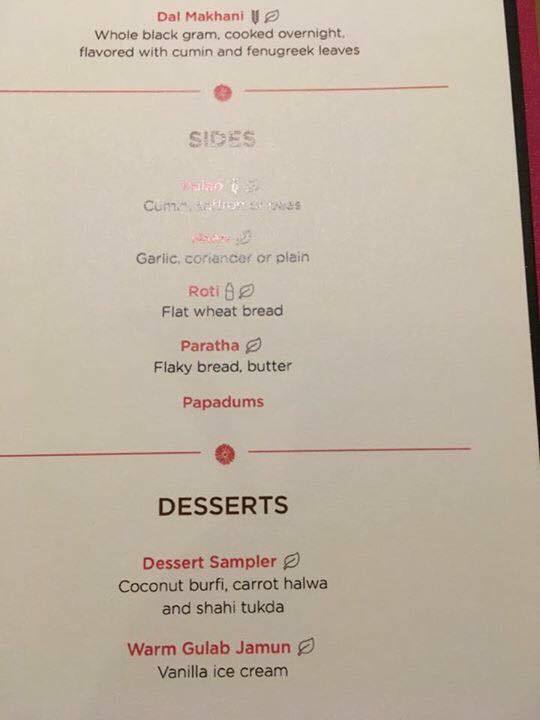 Amanda Scriven-Purcell shared photos on Facebook of the changeover, with a look at the Indian food offered. Royal Caribbean Blog reader Craig Duncan is also on Navigator of the Seas, and indicated the change was made on the current sailing to cater to the U.K. market. This is not the first time Royal Caribbean has made a temporary change to its specialty restaurants. On Radiance of the Seas, Rita's Cantina became Rita's Crabshack while the ship was in Alaska. 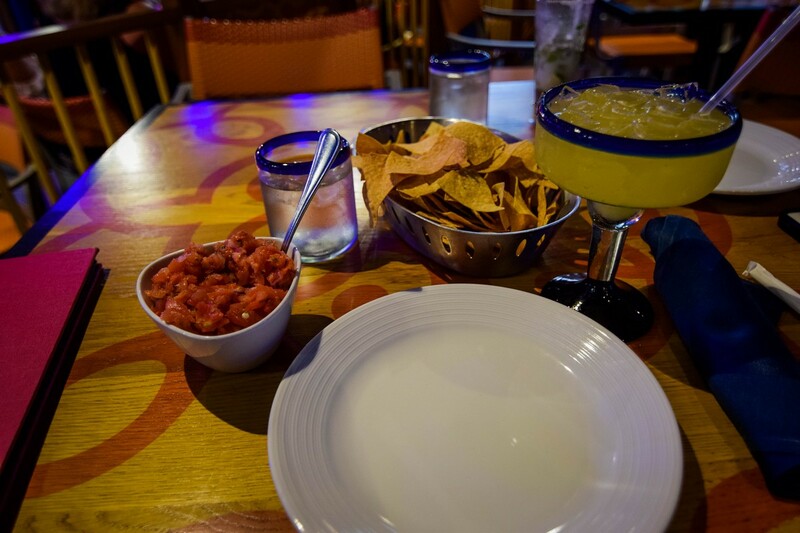 I believe it was the great American thinker, Cher, who postulated, "do you believe in life after love" and I had to consider the same conundrum when it came to trying Sabor Taqueria & Tequila Bar on Harmony of the Seas following a recent menu change. 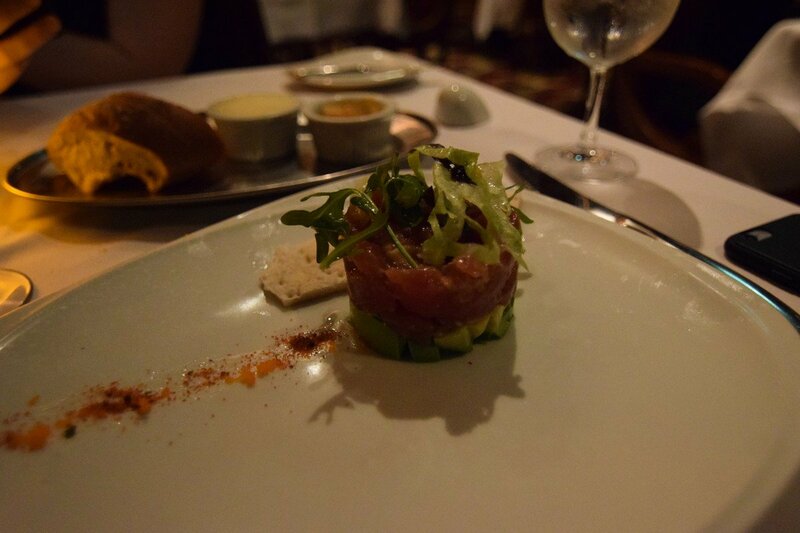 Ever since the Sabor specialty restaurant debuted on Navigator of the Seas in 2014, I fell in love with the whole menu, but the tuna crudo tacos held a special place in my heart. They were as flavorful, and my go-to order each and every time I dined at Sabor. However, with the recent menu change the tuna tacos were removed and I began to wonder if the food at Sabor would be able to stack up with my previous experiences. 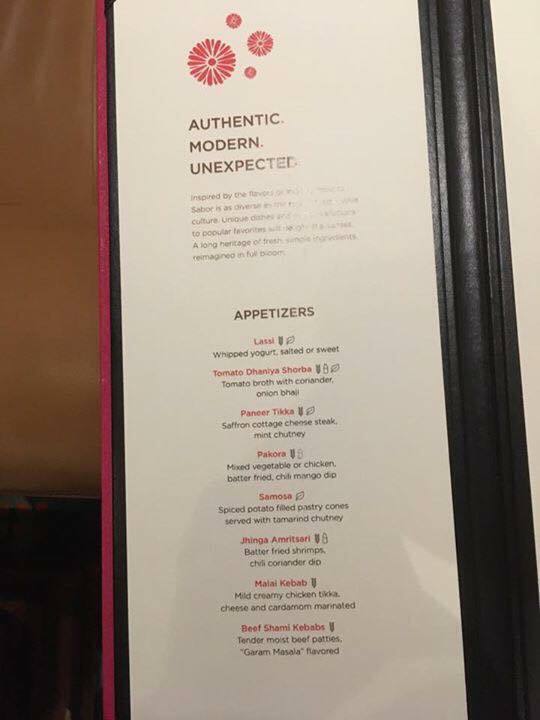 On our recent Harmony of the Seas sailing, I had to investigate the new menu change and determine if anything could fill the void in my heart that the tuna tacos once occupied. While the Sabor menu and pricing has changed, the look of Sabor remains intact. 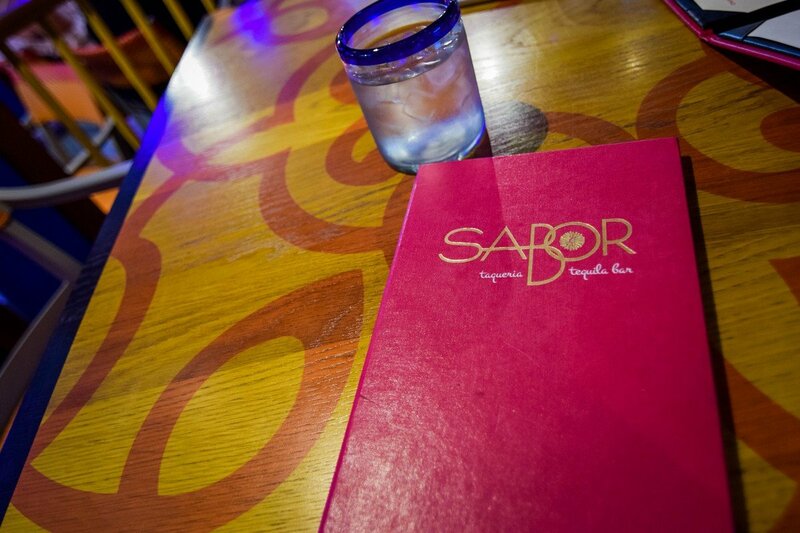 Sabor is located in the Boardwalk neighborhood and encompasses a large area, with ample indoor and outdoor seating. The restaurant is open air, although there is some air conditioning blowing on guests inside, there are no walls to contain it. The restaurant is safe from rain (unless it is really blowing in sideways), but the temperature and wind can still be felt. Sabor is imbued with bright colors, primarily blue, magenta and yellow. 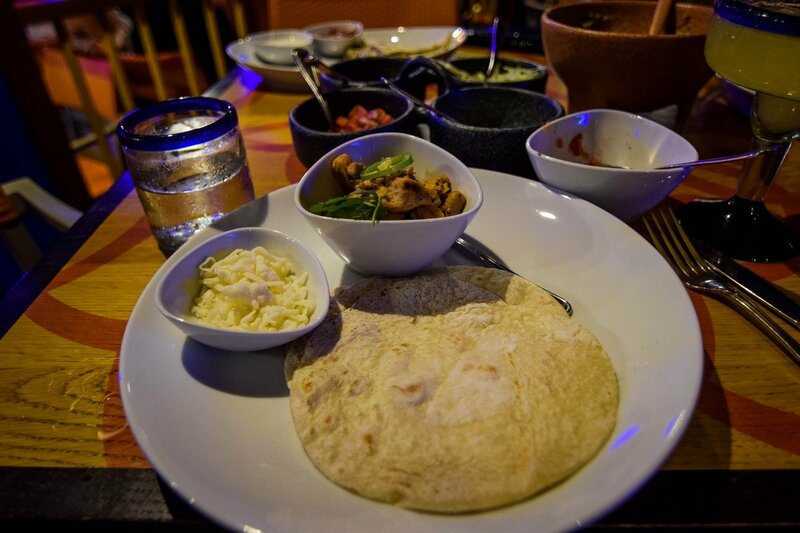 Sabor has that feel of a Mexican restaurant, but without the over the top common motifs. After all, Sabor is meant to be more a more modern take on Mexican cuisine. Much of the seating in Sabor is at standard tables of varying sizes, but there are booths along the back wall as well. Unlike Oasis of the Seas or Allure of the Seas, the Sabor bar is attached to the main restaurant, and offers additional seating on the left side of the restaurant. Most guests opt to grab a beer or cocktail from the bar, but you can also order off the menu. As I mentioned, Sabor changed from an a la carte menu to a cover charge menu earlier this year on Oasis class ships, which mirror the pricing found on Voyager and Freedom class ships. With the pricing change came a new menu, with some items removed from the old menu, others added and most of the menu remaining the same. I would estimate half the menu contains the same items as before, but the other half has seen items swapped it out in some manner. 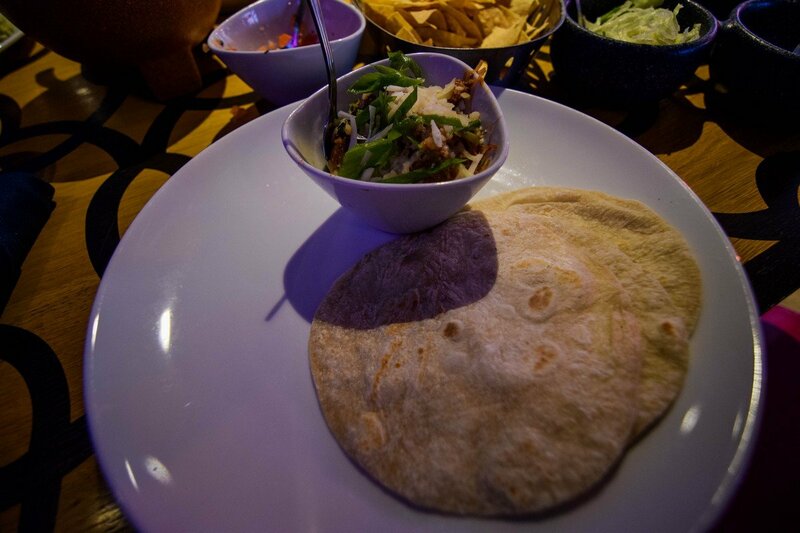 Many Sabor fans relished the margarita menu for the creative and extremely tasty beverages offered. 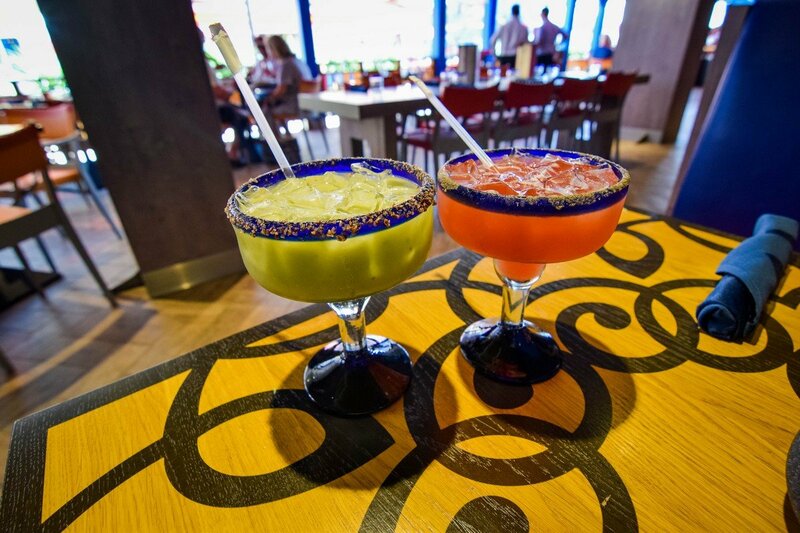 I am pleased to report the margarita menu has not changed at all, and guests can continue to order their favorites. 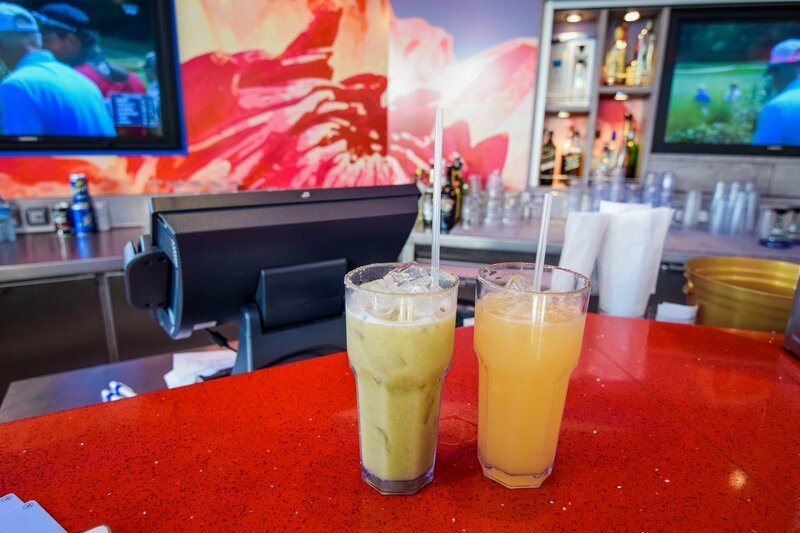 The avocado and Sabor Grand margaritas are my wife's and my favorite drinks, but I encourage you to try them all, especially if you have the deluxe beverage package that includes them. The new Sabor menu on Harmony of the Seas has a lot to offer, and with your cover charge, you are at liberty to order as much as you like. We have met no resistance in ordering multiple entrees, appetizers or anything else on the menu. With larger groups (more than 4 people), your best bet is to order a lot and share. Much of the menu comes in a very shareable manner. 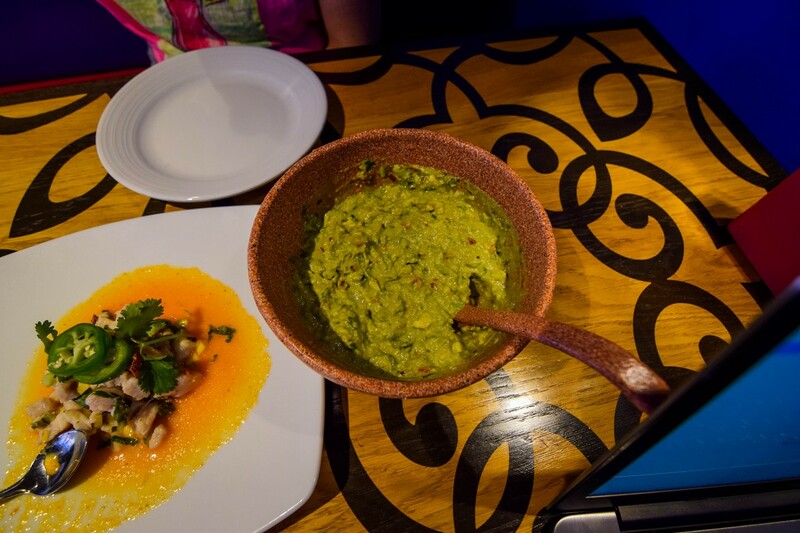 No meal at Sabor is complete without a bowl of handmade guacamole. Sabor's reputation has been built on its guacamole, and while the guacamole is no longer crafted at your table (health regulations emerged last year that curbed that practice), your server will still ask you how you like it and prepare it in the kitchen. Our favorite is medium spice, extra lime juice. Suffice to say, the guacamole is still exceptional and the pico de gallo salsa is especially good. The only downside is all too often I fill up on this stuff before my food arrives. Moving onto the appetizers, you will find some good starters offered. The menu refers to them as "small plates" and it is appropriately named, as these are great for sharing and wont fill anyone up on their own. 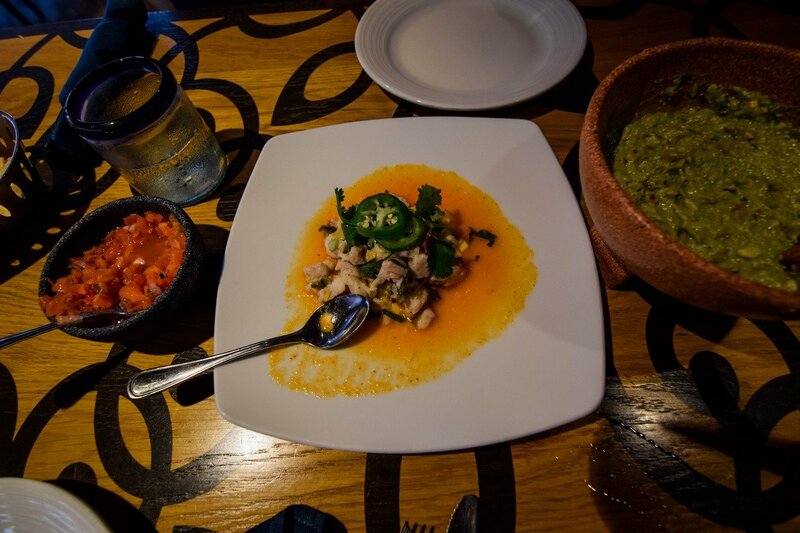 The red snapper ceviche is a light starter that goes great with the chips they serve at your table, or just enjoy on your fork. 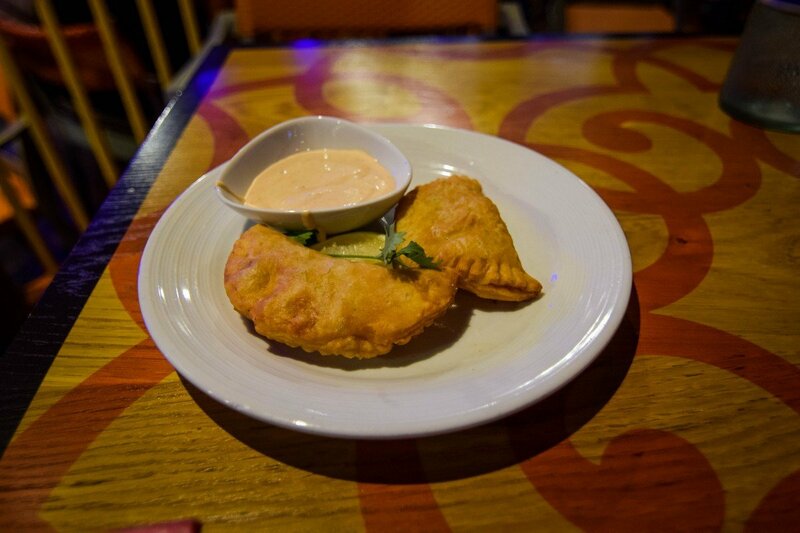 The spicy beef empanadas are terrific. The flaky crust they are baked in is lovely, and it has just the right amount of "kick" to set the tone for the meal. Many of our readers swear by the chicken-stuffed jalapeños wrapped in bacon, and while we did not order them, we would be remiss if we did not mention them as something to try if you are a bacon lover. Moving onto the tacos, it was time to find a new love. The tuna tacos are no longer available on the Sabor menu on Harmony of the Seas, but there is still a fish taco option in the grilled cobia. Over the course of my cruise, I decided to employ the Love Connection methodology and try out three different tacos: the shredded beef short rib tacos, the spicy chicken tacos and the grilled cobia tacos. Another change to the tacos from the old menu is the tacos are now build your own. This means you are served the protein of your taco in a bowl that you can fill your soft tortillas with, along with an assortment of toppings, such as lettuce, salsa and sauces. Be sure to save some guacamole for this part of the meal to use that too (or just ask your server for some more if you lack the ability to not eat every last ounce of guac in your bowl). I was not too sure about the build your own tacos, but I ended up really enjoying the idea. I am the kind of person that goes into "mad scientist" mode when it comes to crafting my own food, and I loved lopping on as much as I can into my tacos before eating them. Granted, my tacos probably ended up looking more like burritos, but making them was half the fun. The grilled cobia tacos ended up being my favorite of the three I tried, and I suppose it shows I am truly a fish taco lover at heart. The spicy chicken was also quite good, and a close second. 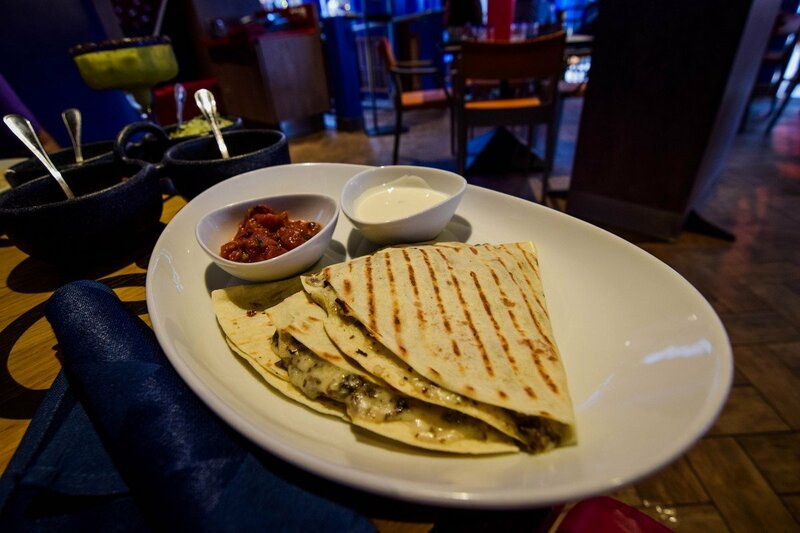 In addition to tacos, there are a few quesadillas to try. My advice is take the quesadillas and top them off with guacamole, salsa and anything else on your table to essentially make them into Mexican pizzas. Regardless of how you eat them, they are really good and flowing with melted cheese. If there is one area of the Sabor menu I never bother with anymore, it is the sides. I have never found them particularly compelling, but perhaps you will find them to be different. The new menu features a grilled corn on the cob option, so if you have tried that, feel free to share your thoughts in the comments. By far the most under appreciated aspect of Sabor's menu are the desserts. No meal is complete without a few, and you should save room for them, even if that means turning down another serving of guacamole. If you are new to Sabor, order them all and sample them. 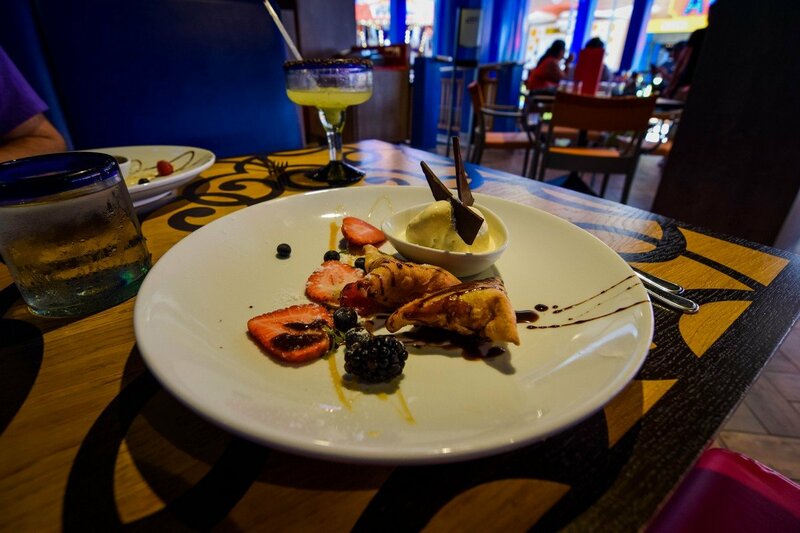 Our favorites are the banana and chocolate chimichanga and café con leche. 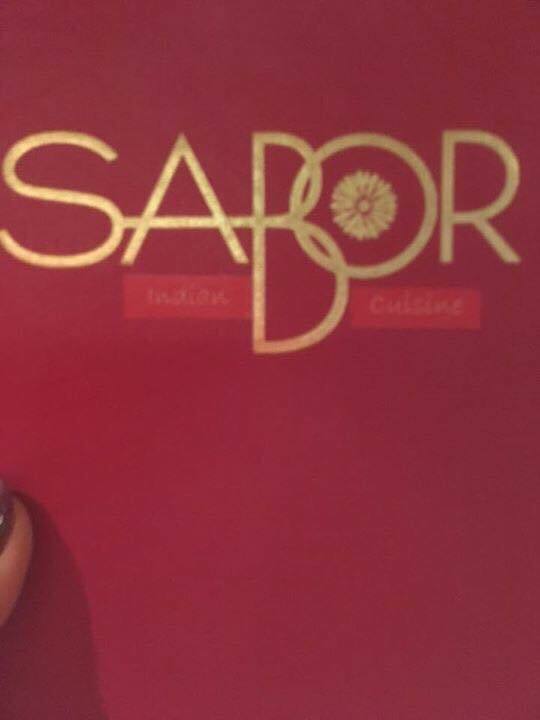 Looking at the new Sabor menu and pricing, I really enjoyed the new offering. As a repeat cruiser, getting some new choices on the menu is a welcome change and I found the menu to remain true to what made Sabor so wonderful all these years. It seems the biggest issue some folks have with the new menu is not the food, but the pricing. 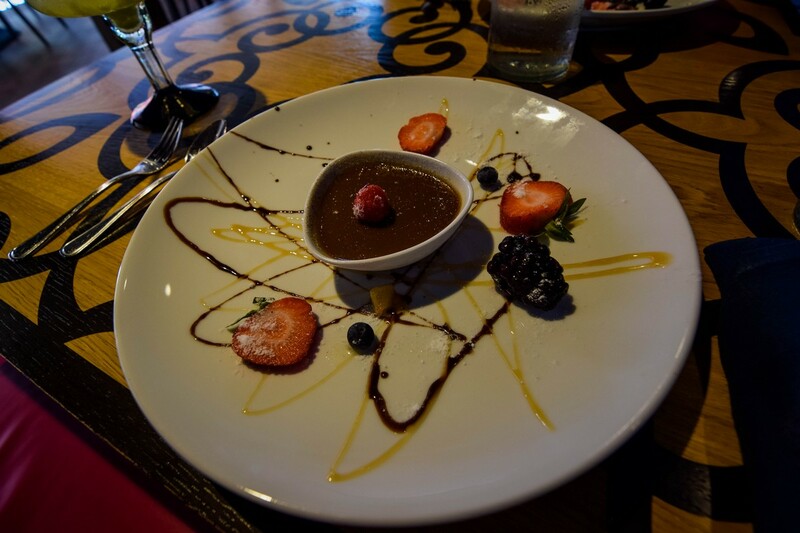 There are a number of vocal guests that enjoyed Sabor, but preferred the a la carte pricing structure so that they could drop in for quick bites to eat at a cheaper price than the all-inclusive model. I cannot deny the virtue of that concept. Frankly, I do not mind the cover charge pricing, perhaps because I first tried Sabor on Royal Caribbean ships that had a cover charge so I was indoctrinated into that concept early on. 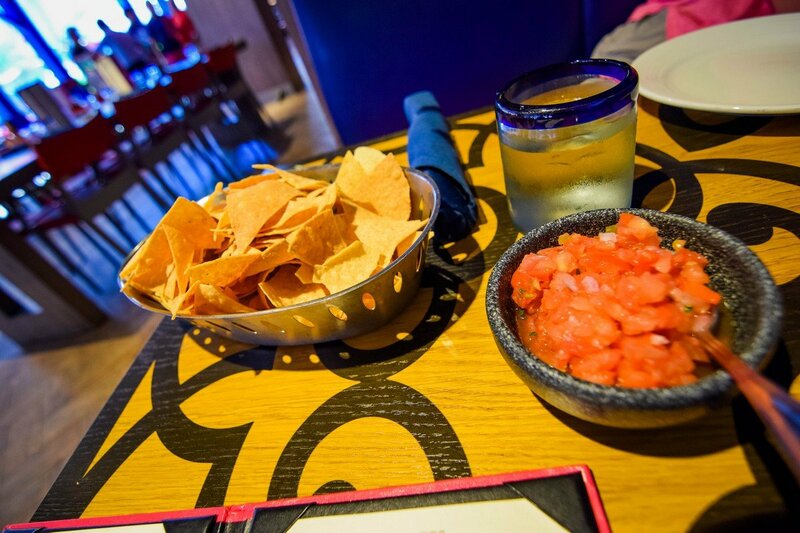 For those that refuse to pay a cover charge, you can still grab some guacamole and chips during happy hour. For the cost, I feel guests can get a lot of value out of the meal. Sabor is still among the least expensive specialty restaurants on Harmony of the Seas, and I cannot complain I have ever left Sabor hungry. 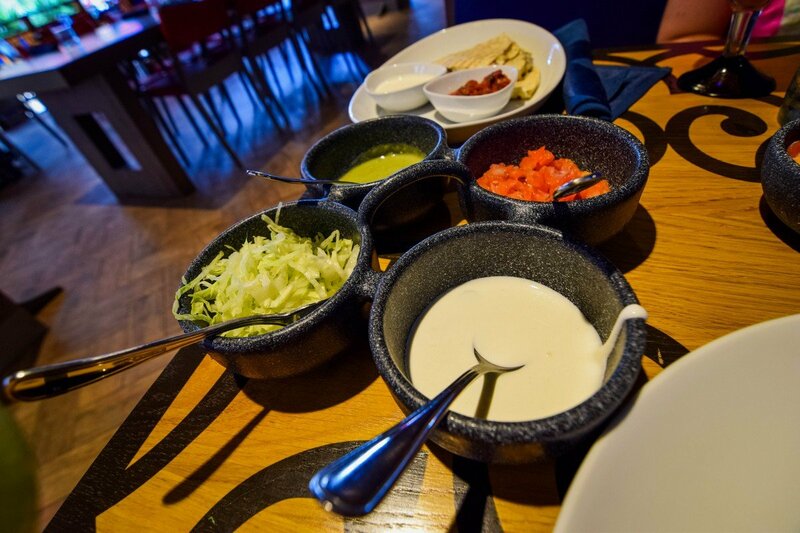 Moreover, the strength of the appetizers and guacamole make for a compelling dining experience. Cost: The price for Sabor on Harmony of the Seas is $19 per guest for lunch and dinner.